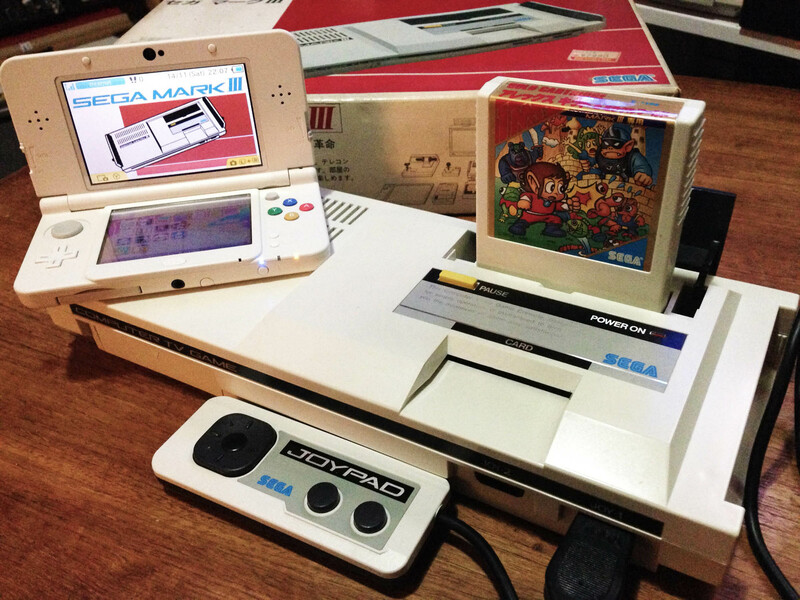 Mark III – Nintendo Sega Japan! 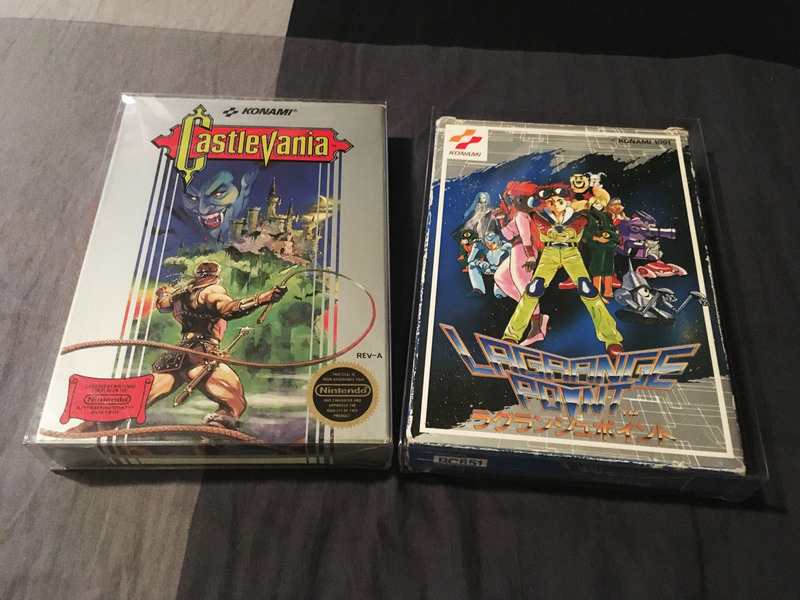 I’m a great believer in game box protectors. 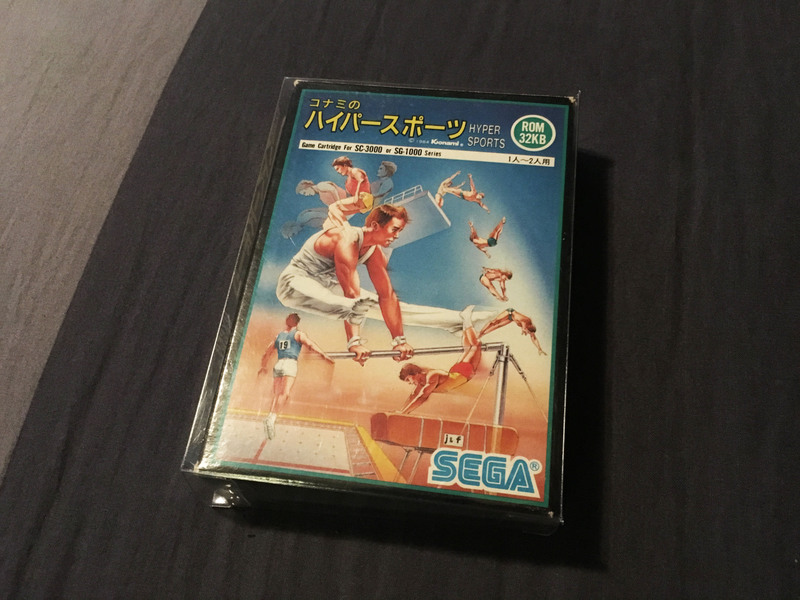 With vintage games only getting older, anything that helps them (and their related paraphernalia) to stay in great condition without being fully archived is a great investment. 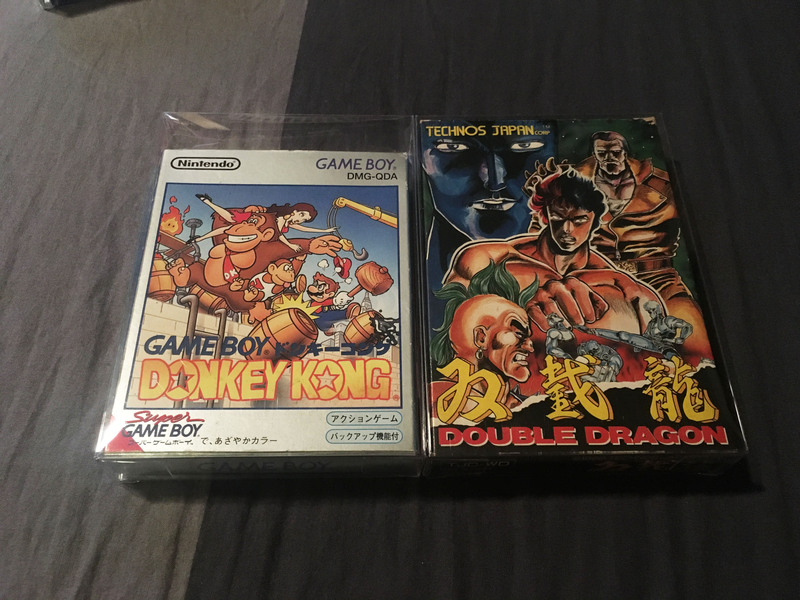 I recently got some box protectors for my Japanese Game Boy/Game Boy Color games. 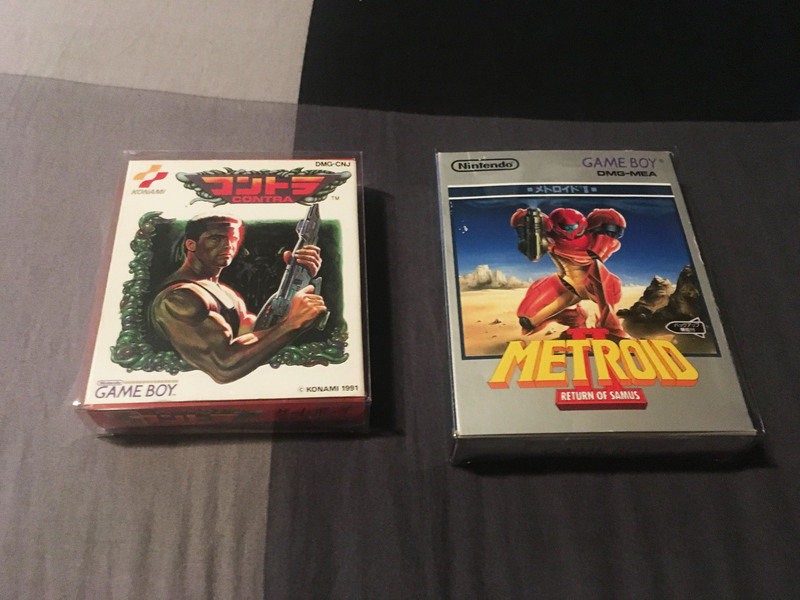 There are two sizes for Japanese Game Boy games, the original size which are very small, and a later size which is about 4/5 of the ‘standard’ Famicom box size. 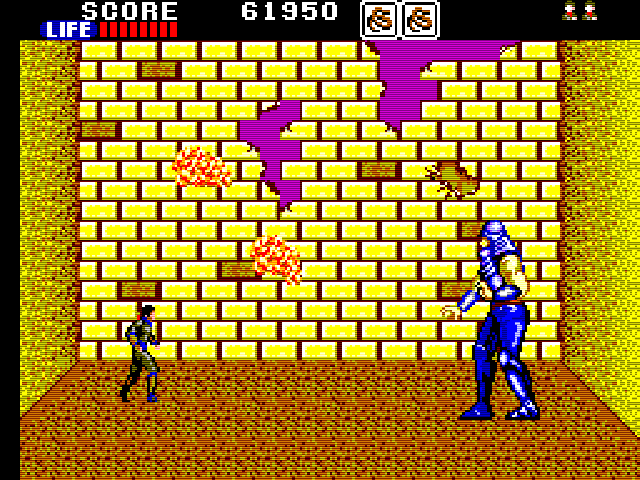 This later size continued through the Game Boy Color era too. 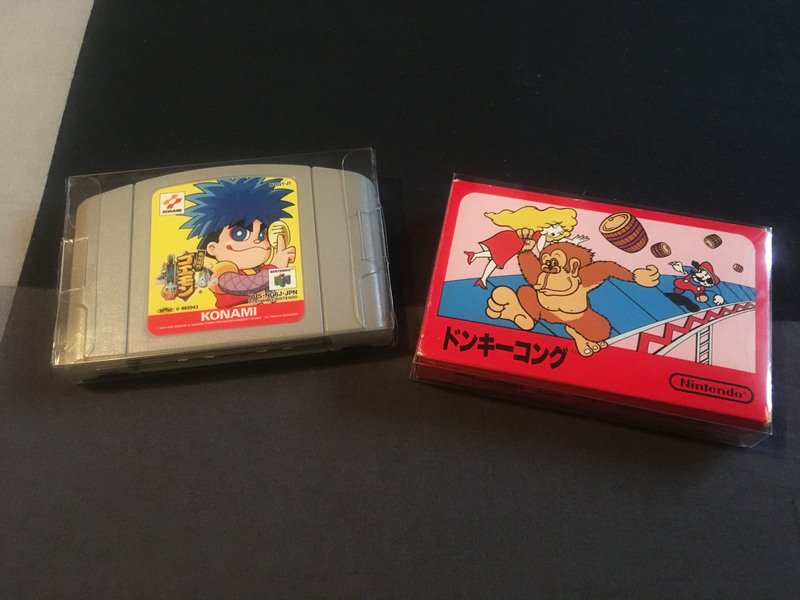 Previously I had stored my small Japanese Game Boy games in Japanese Game Boy Advance protectors, which were okay in one direction, but way too big in the other two. 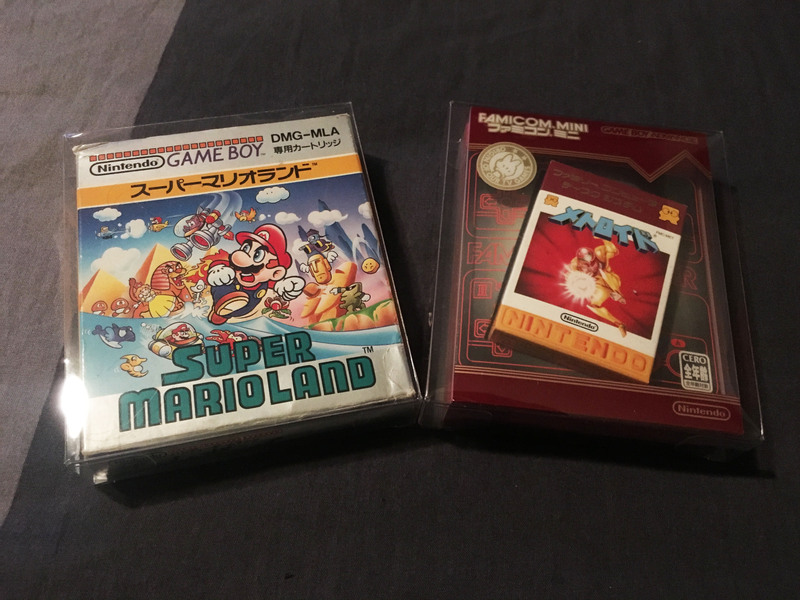 Similarly, I kept my larger Japanese Game Boy games in Famicom box protectors, which was a closer fit but still quite a lot of room at the top. 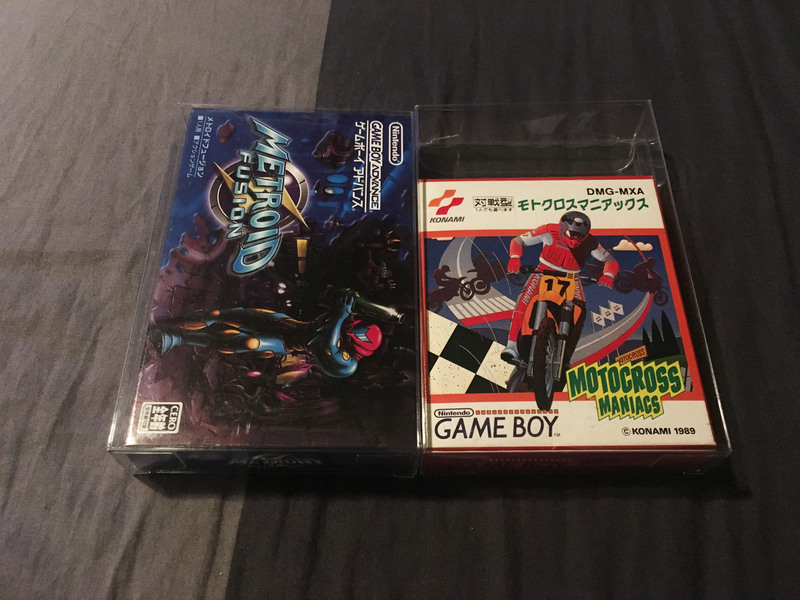 It’s great to finally have my Game Boy games secure in snug fitting protectors. 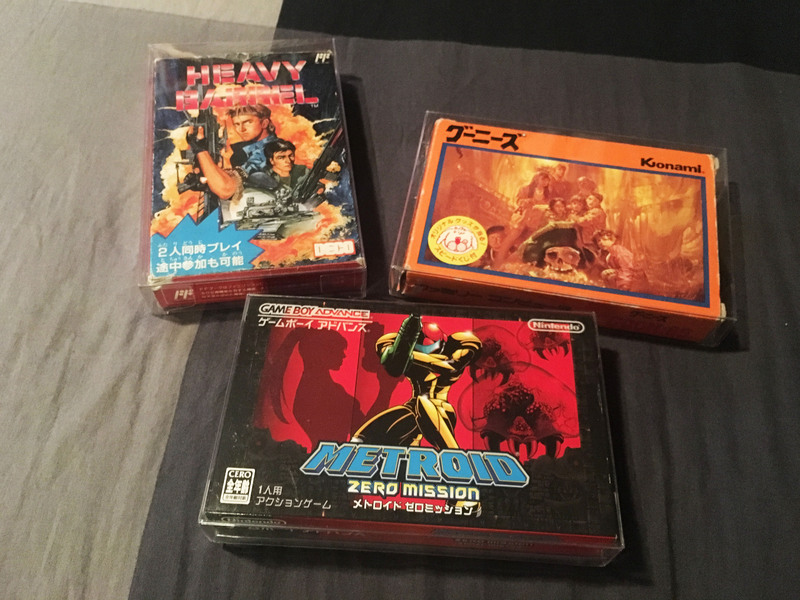 I was glad to find these Japanese Game Boy sizes, as a good fit is important for protection. 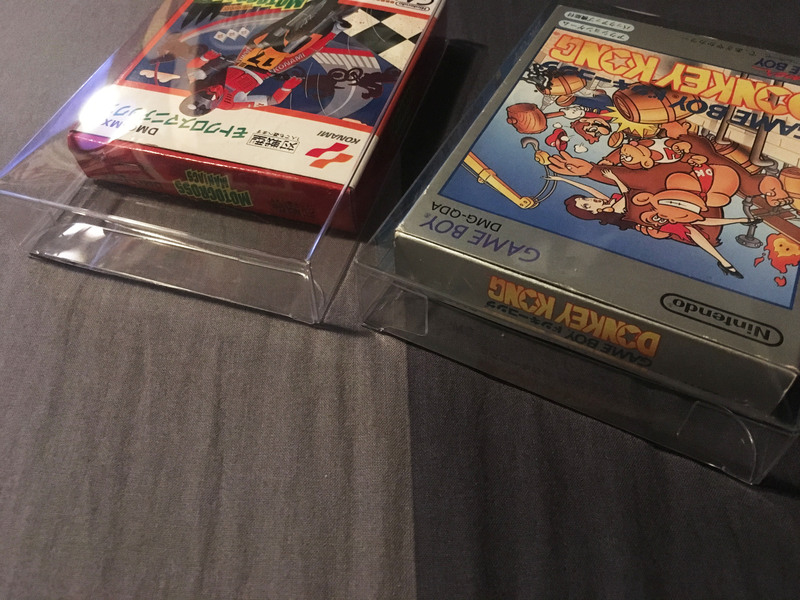 It’s hard (or impossible) to find decent box protectors for less common box sizes, so here are some adaptations of sizes designed for other purposes that I use. While usually not perfect, they are good enough for solid protection without too much internal movement. Only a small amount of room to move. 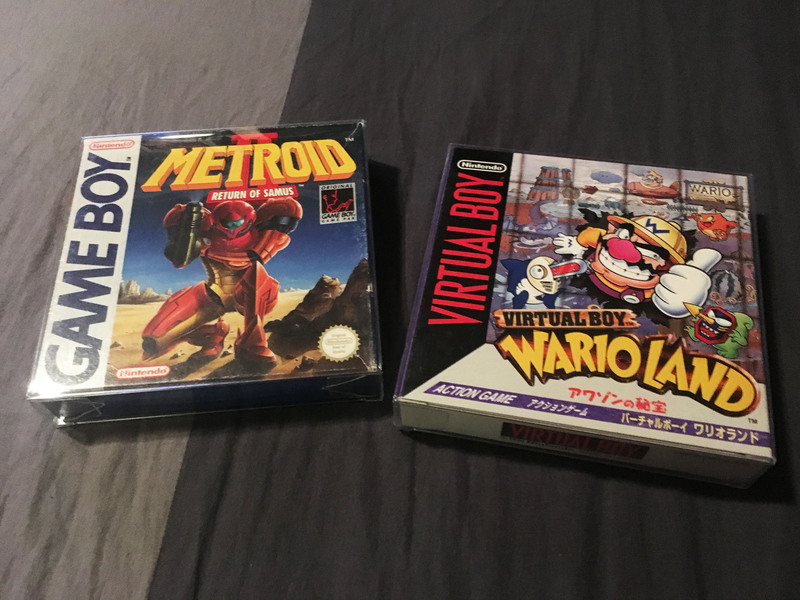 Western Game Boy protectors obviously work perfectly for Virtual Boy boxes. 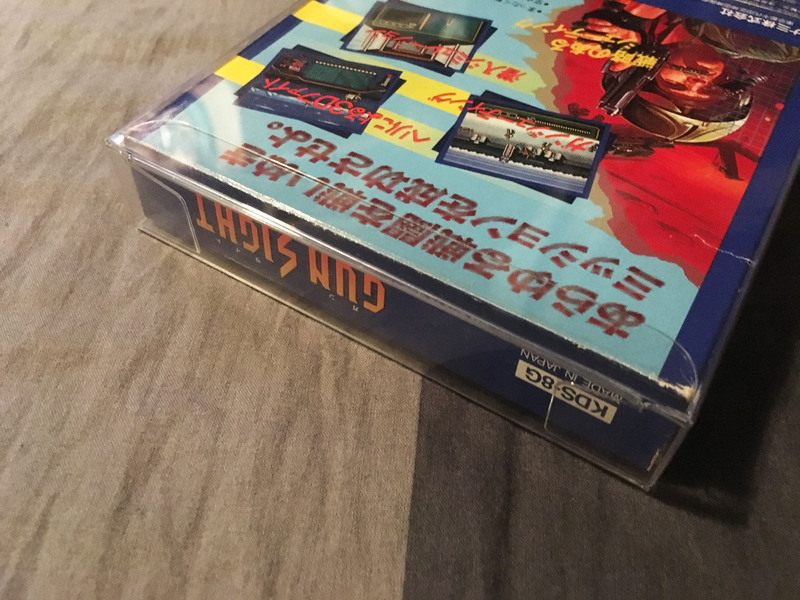 NES protectors work nearly perfectly for the large size Konami Famicom games. 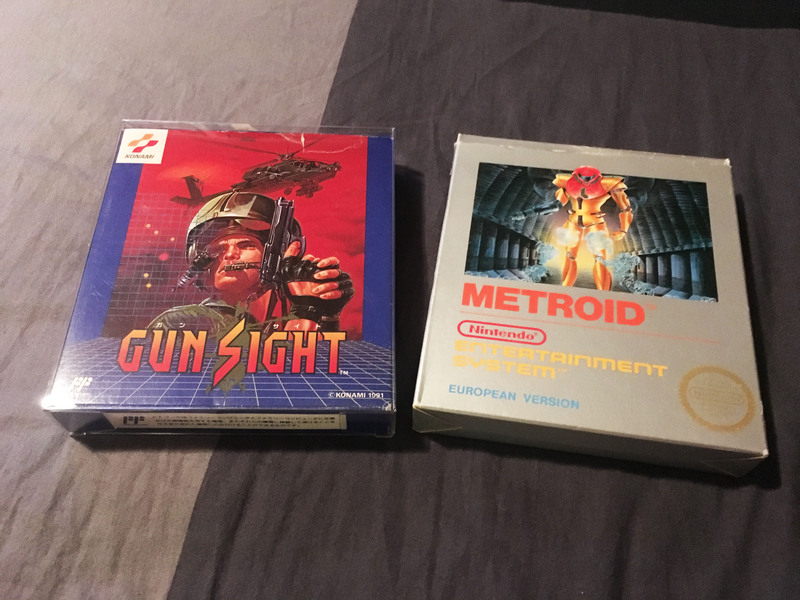 The unique Gun Sight box is nearly an exact match for Euro NES size protectors. 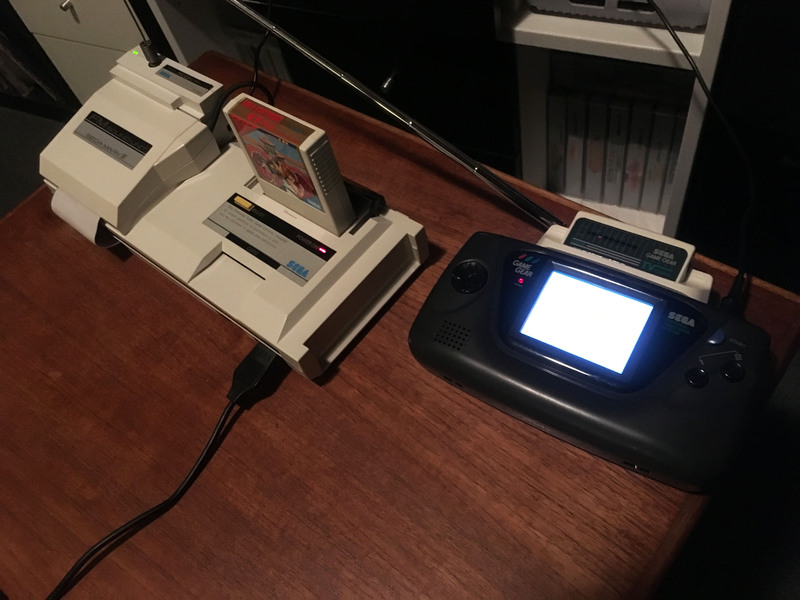 Famicom protectors work okay for small SG1000 games. It’s not really the right size in any direction and is very tight, but protects okay. 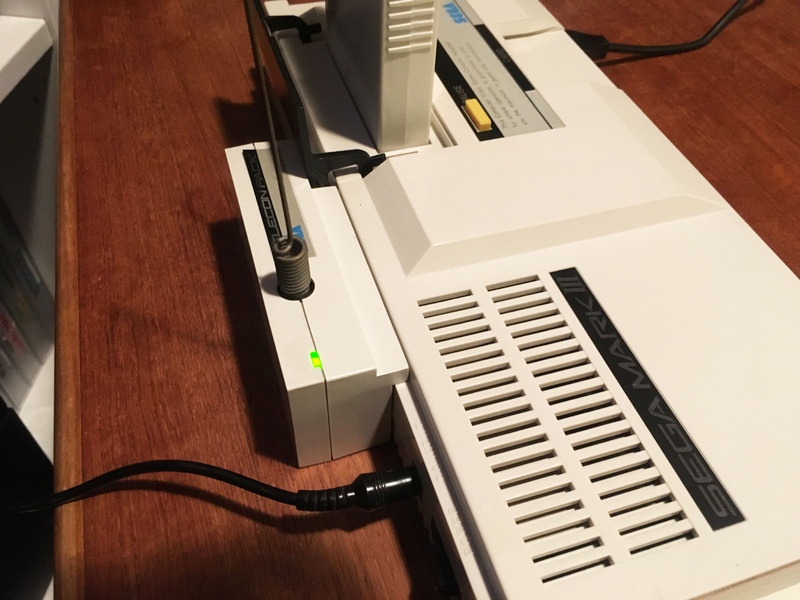 Large SG1000 boxes are a perfect match for an older style ‘too big’ NES protector size I found. 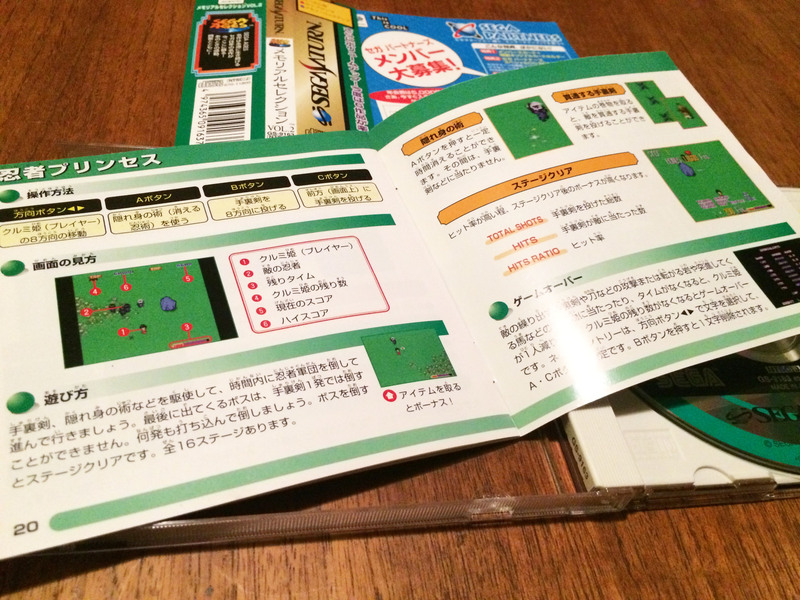 And finally, I’ve recently tried Nintendo 64 cartridge protectors on my small box Famicom games. 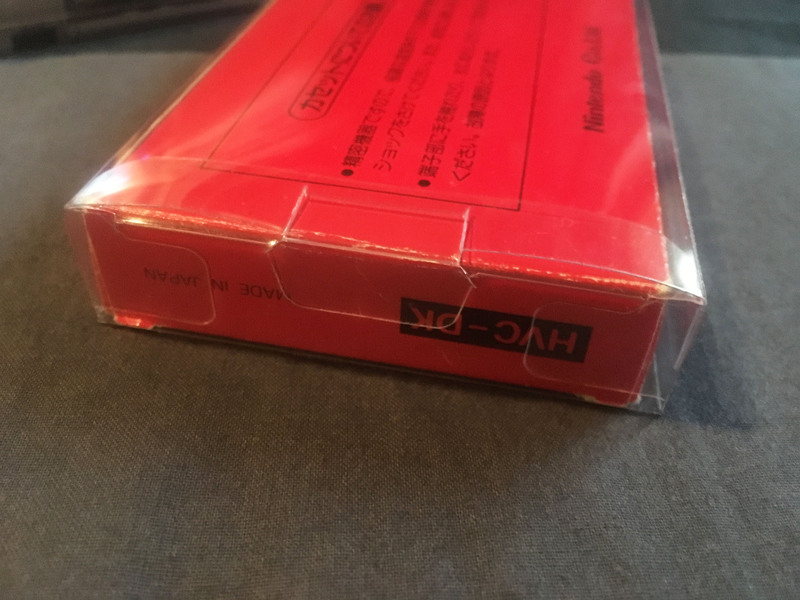 The fit is not perfect, much like the SG1000 games in large box Famicom protectors, they’re too tight in thickness, but too large in other directions, so they fit, but are somewhat tight. Until there is a better option, it’s a decent solution. 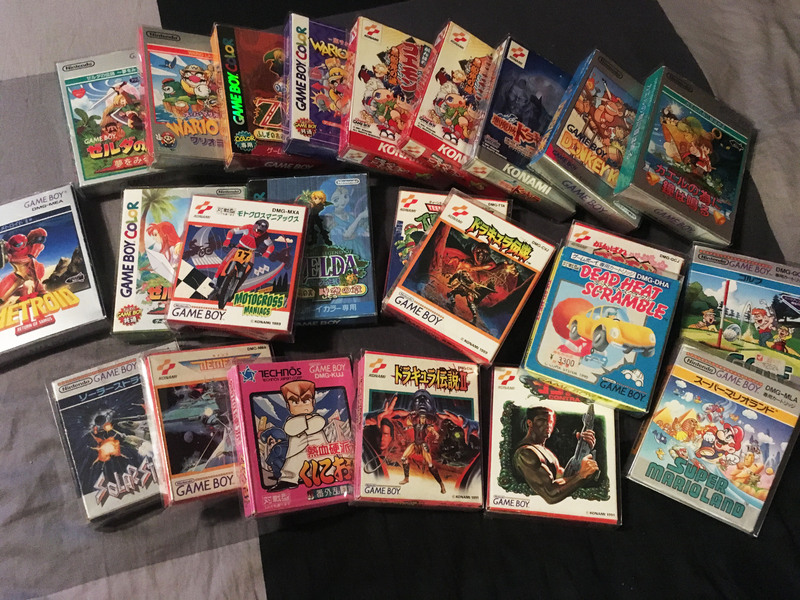 I had customs done for all these SG1000/Mark III box sizes. 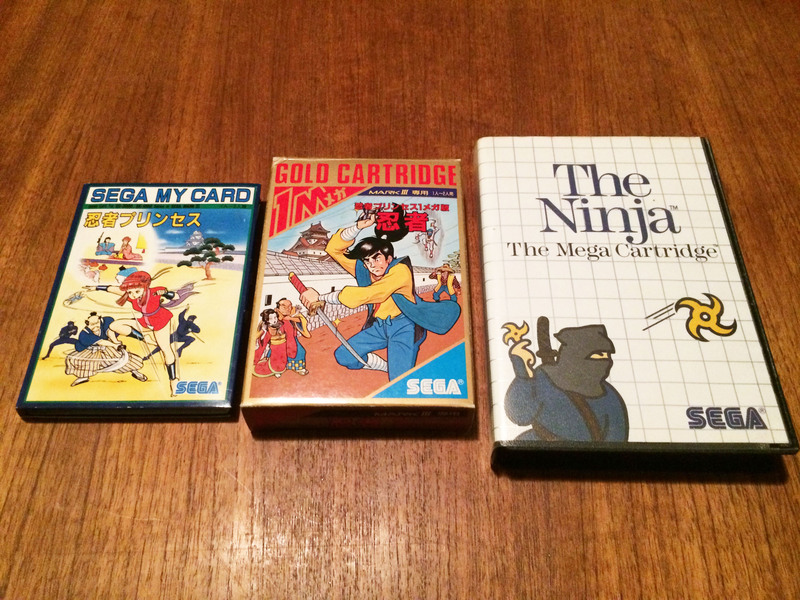 It’s a fully one off for Alex Kidd BMX (it’s the only box of that size), but a few each for the two card game sizes and big box Mark III gold. 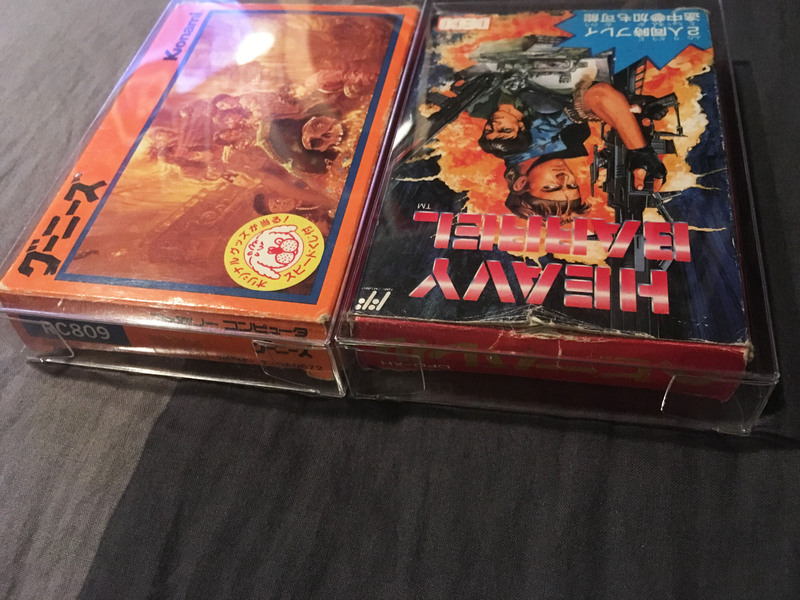 Unfortunately the producer of these customs has quit the business, so I’m on the lookout for a new producer, if anyone knows of one! 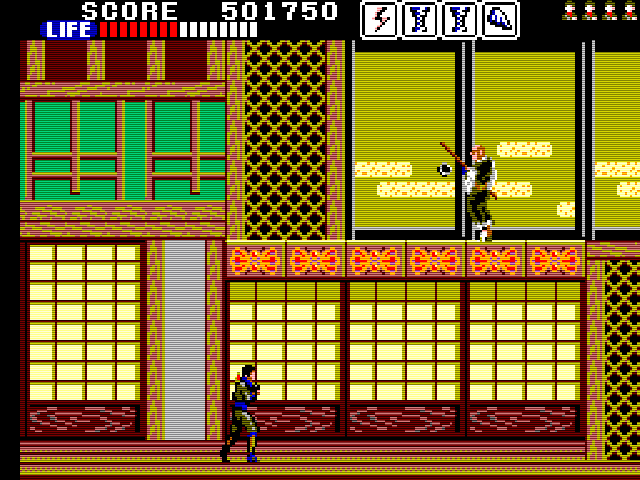 Ninjas were everywhere in the 80s, and Japanese game developers were happy to fulfil the international demand for martial arts action. 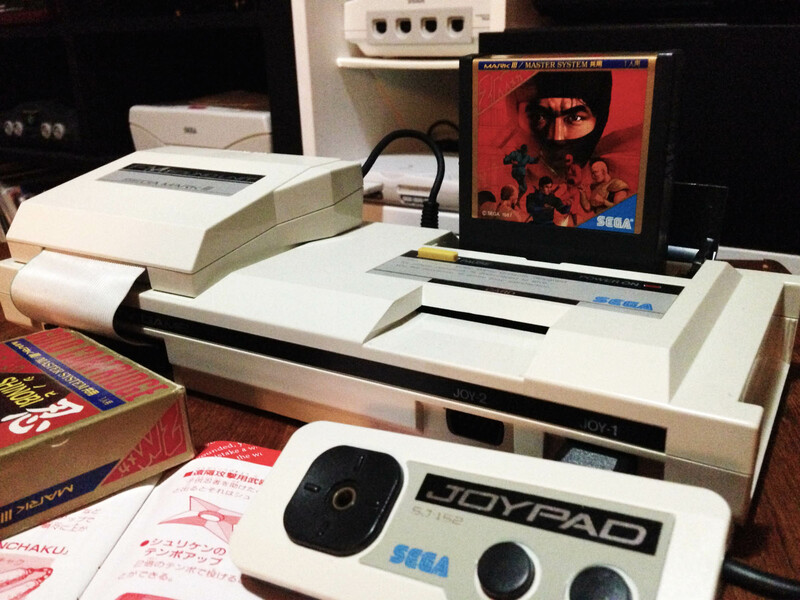 Nintendo’s console had Kung Fu, Ninja Gaiden, Ninja Turtles, The Legend of Kage, Shadow of the Ninja and many others. 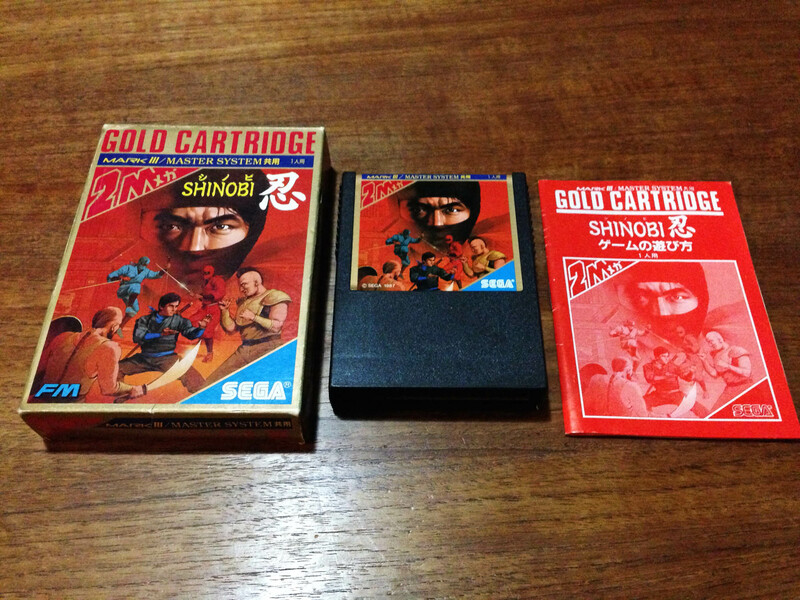 Sega had their Shinobi and Dragon Wang series, as well as their shortlived Ninja series. 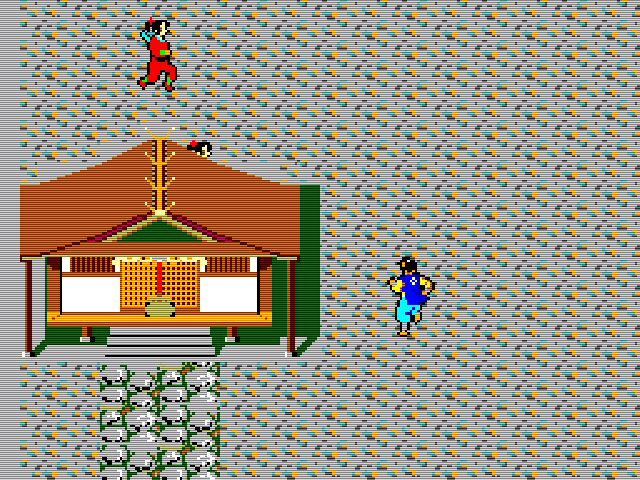 Much like the Dragon Wang/Makai Retsuden series, Sega’s Ninja series is a somewhat convoluted progression of the same basic game template over a couple of generations of hardware. 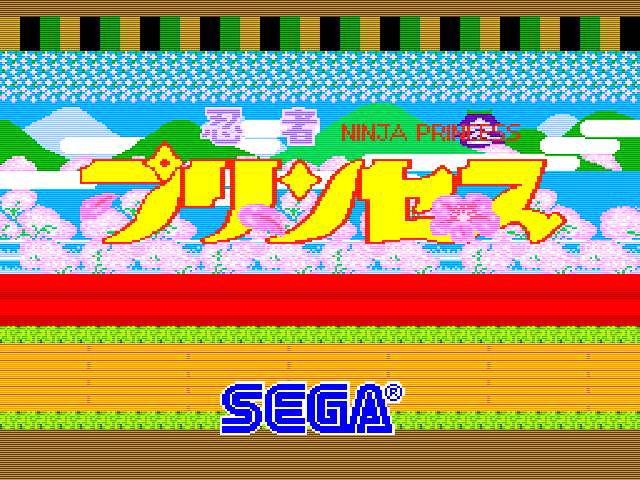 Ninja Princess (released in the west as Sega Ninja) began as a Sega System 1 arcade game in 1985. 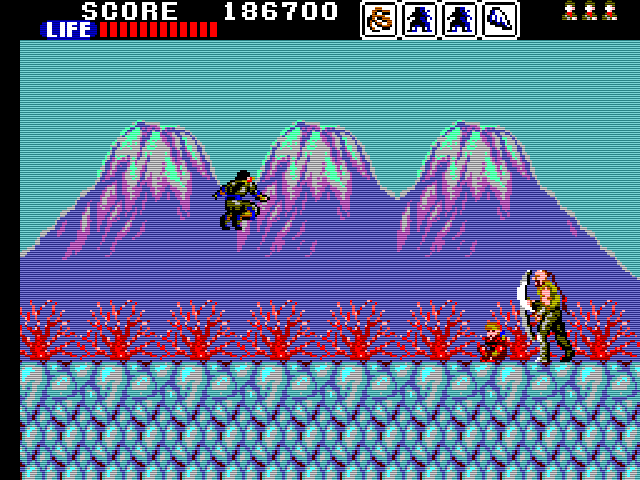 It’s an overhead run-and-gun game, one of a batch released around that time, such as Capcom’s Commando and SNK’s Ikari Warriors. 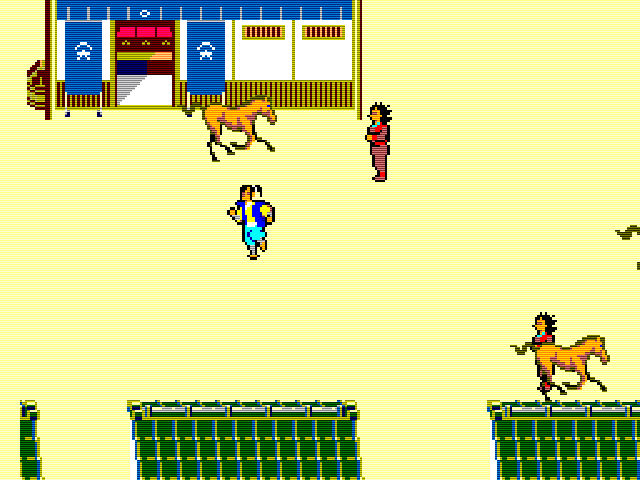 Swapping out a warzone and slow moving bullets for Sengoku-era Japan and throwing knives, Ninja Princess is one of the first ever examples of an action game with a female protagonist, a whole year before the highly celebrated Metroid. 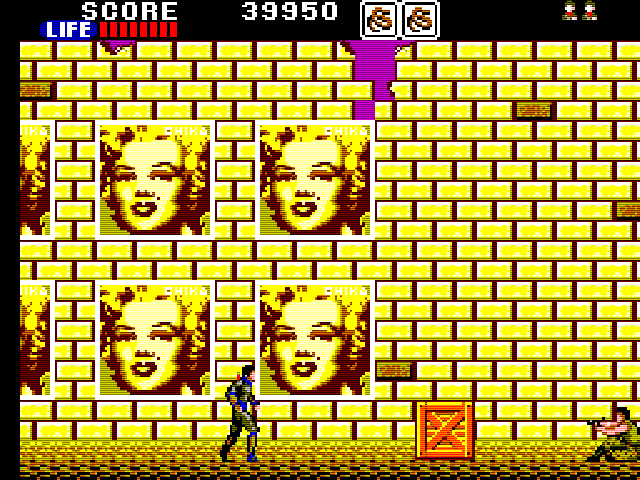 The game stars titular princess Kurumi, whose castle has been overrun by bad guys. 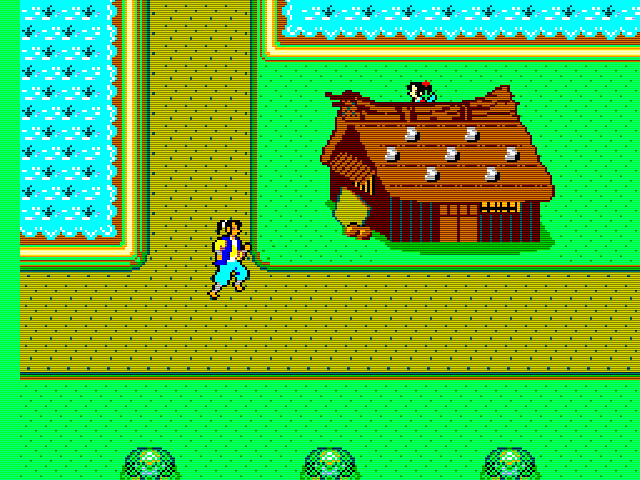 She escapes a kidnap attempt in a cute animated intro, and sets out to take back the castle with her ninja skills. 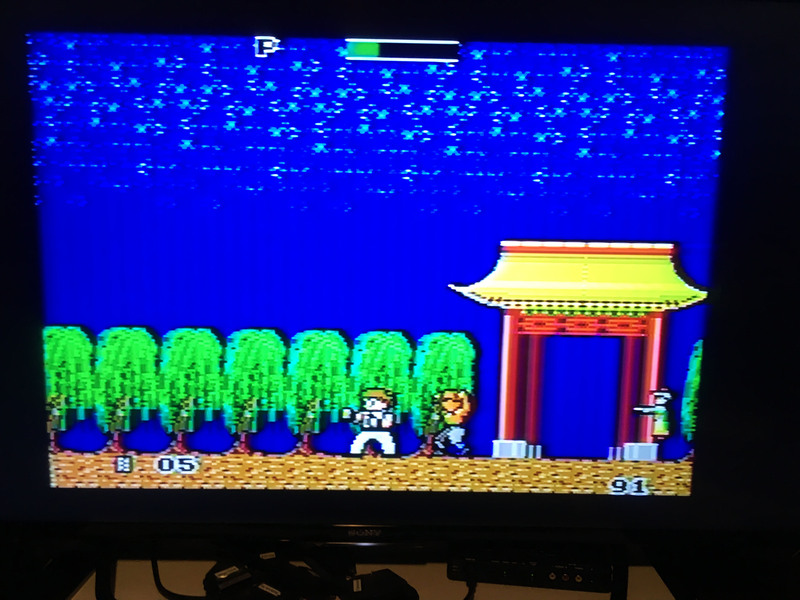 It’s a truly great example of the genre, with tight gameplay, great graphics and sounds, and some nice gimmicks. 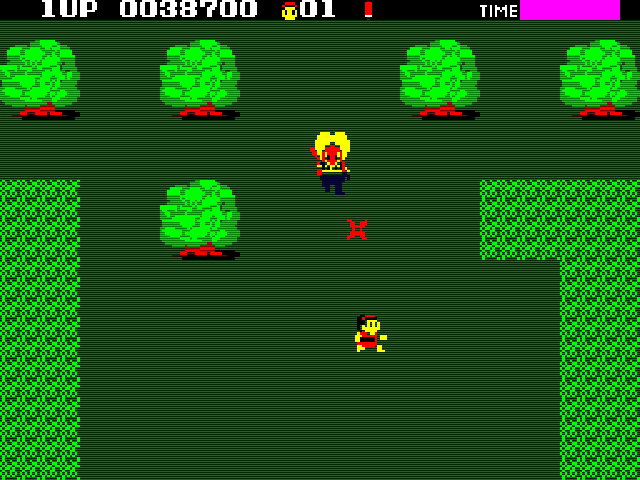 You have two fire buttons – one fires knives (or via a power-up, ninja stars) in the direction you are facing, and the other always fires directly up, no matter which way you are oriented. This innovation completely fixes the clunky feeling the genre can have, as you can actually fire at enemies while retreating. 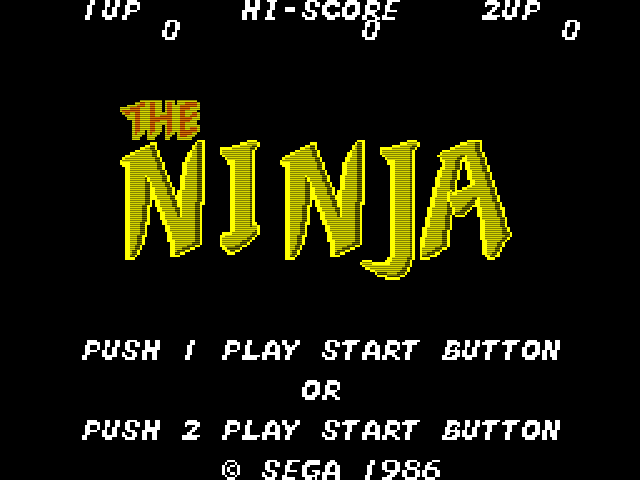 The third button activates a temporary ninja-vanish to evade enemy attacks. 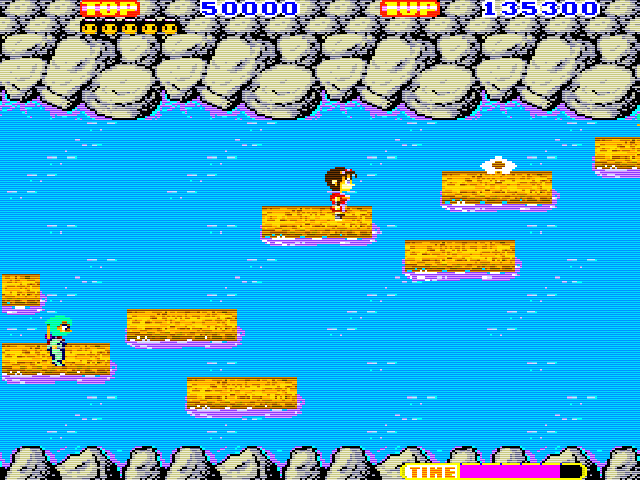 On top of this, Ninja Princess mixes up the gameplay with gimmick/event stages, including a stage where you avoid falling boulders, another with stampeding horses, one set on logs floating on a river, and two stages where you climb castle walls. 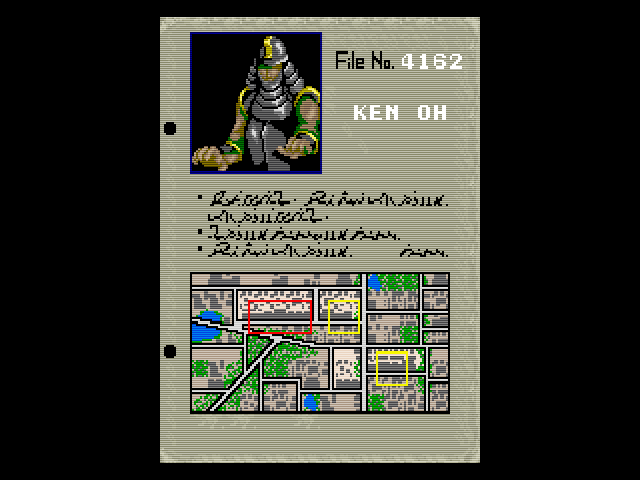 The graphics are fantastic, especially for 1985, colourful, detailed and stylish, and Kurumi herself is a particularly cute and nicely designed sprite. 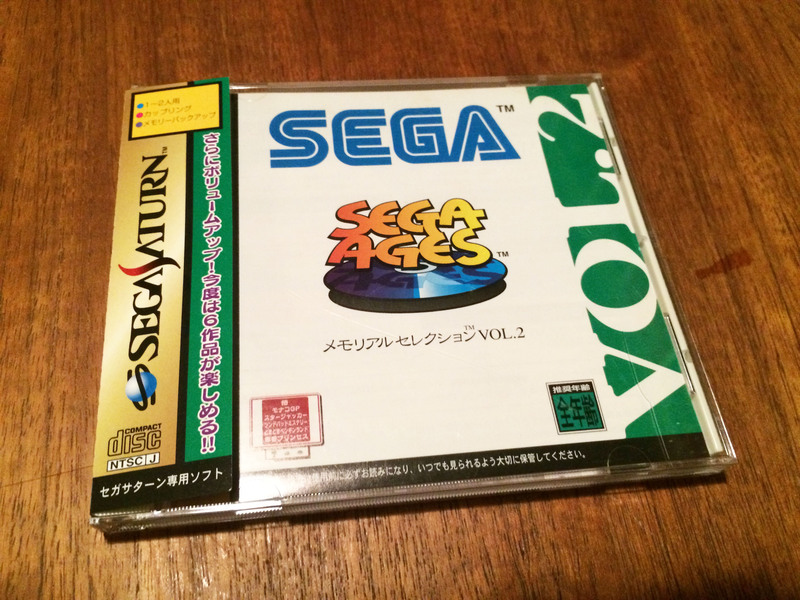 The original arcade version is available on the Saturn, included in the compilation package Sega Ages Memorial Selection Volume 2. 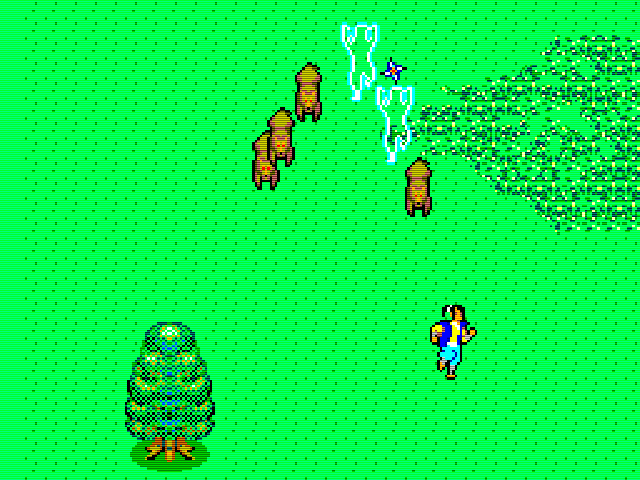 It has a slightly squashed aspect ratio to fit in the Saturn’s resolution (but with no detail loss), and the graphics have been slightly retouched, mostly for the better. But it is a great way to play the game. 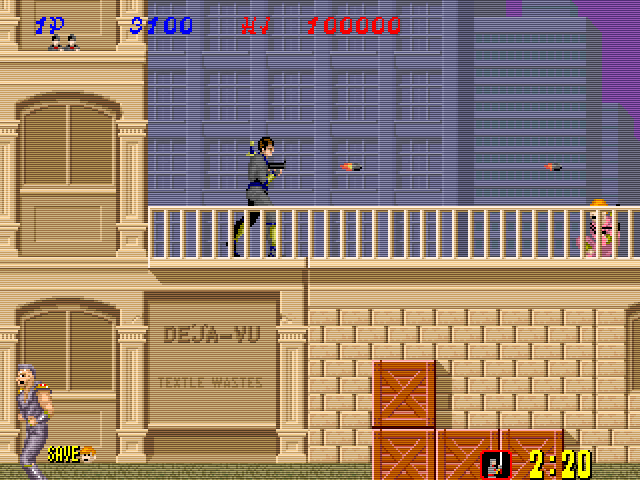 One of the menu options allows you to play with infinite lives, which is a godsend, as being an 80s arcade game, it’s brutally difficult in the later stages. 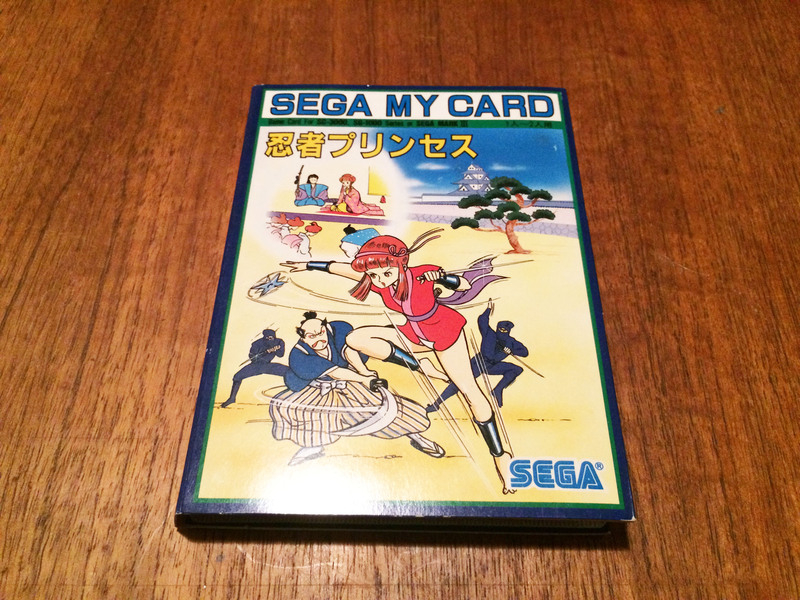 Sega’s first contemporary home port was for the SG1000 in 1986. 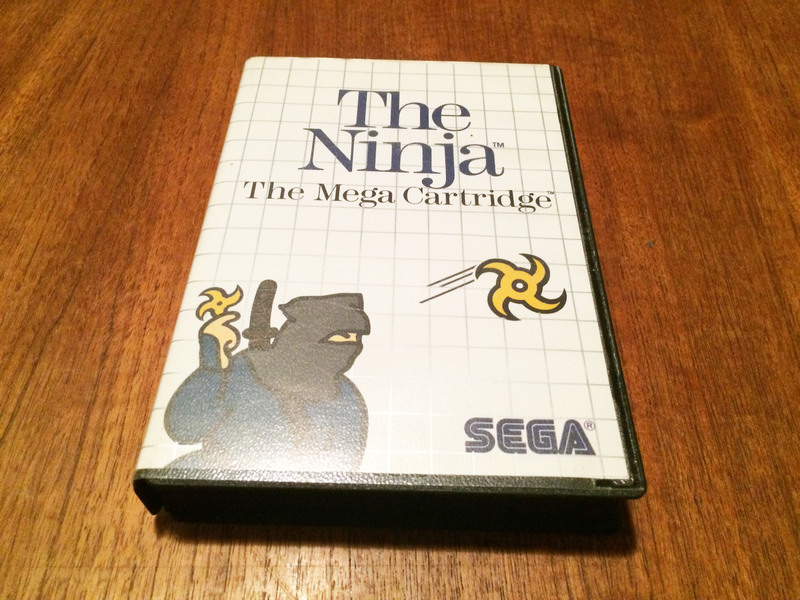 As you’d expect, the graphics have taken a fairly big hit, and with only two buttons the ‘ninja vanish’ function has been mapped to hitting both action buttons at once, but it’s otherwise as faithful a port as could really be possible on the hardware. 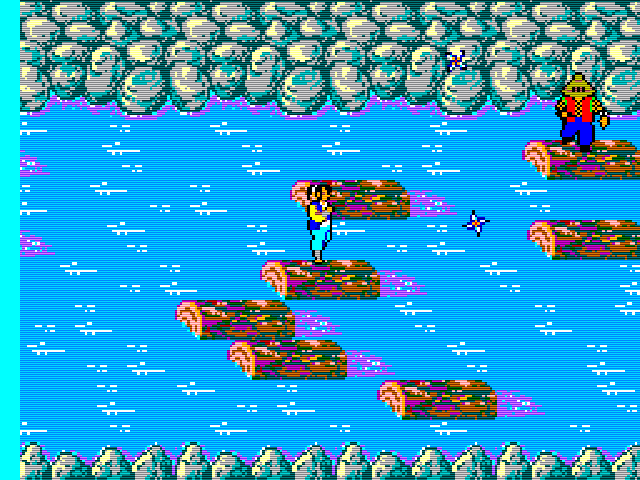 The event stages are gone, but otherwise pretty much the entire game is intact, including the climbing stages. 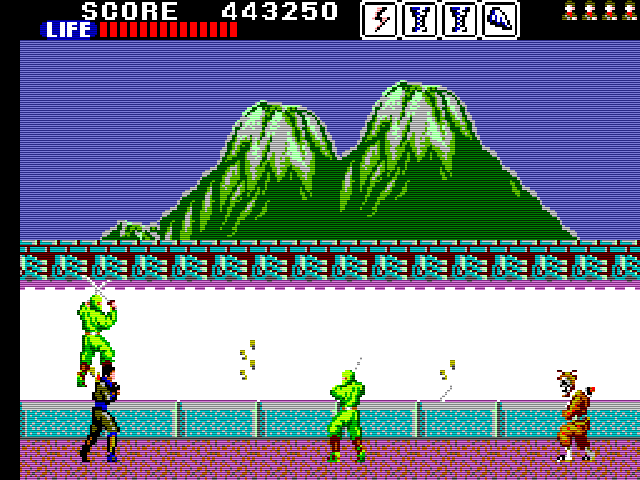 It’s actually quite fun to see some of the set-pieces from the arcade re-created in a more primitive form, and while the enemy ninjas are mostly single colour sprites in this version, their single colour often matches the primary colour of that enemy type in the arcade – you can see the designers of the port really tried to make it resemble the original. 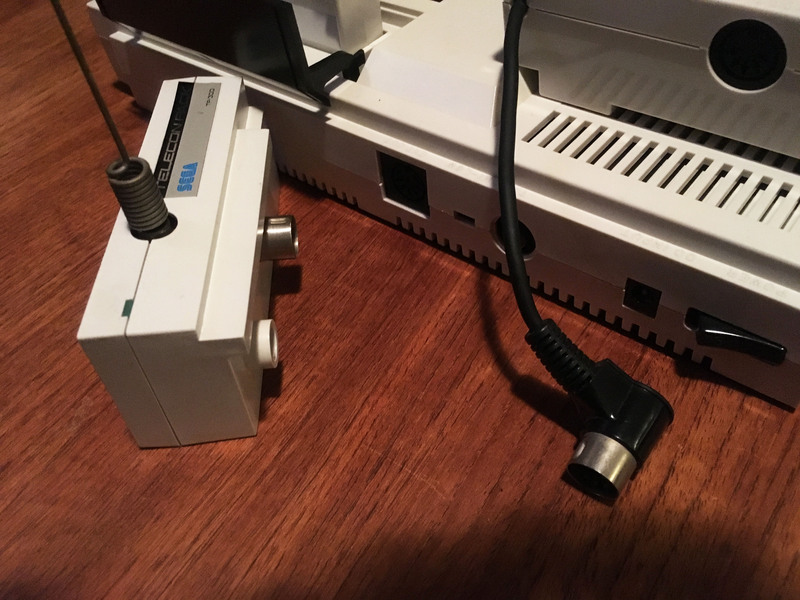 The dinky SG1000 graphics have their own charm, and assuming you’re using a decent controller it plays really well for an SG1000 game. 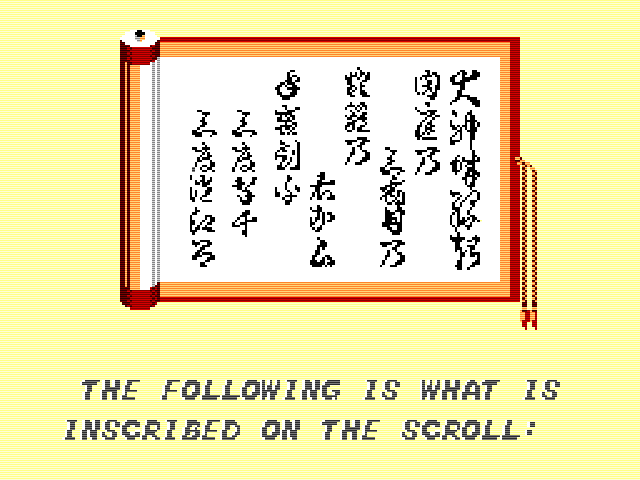 In an attempt to prolong the life of the title for home gamers, it introduces a ‘secret scroll’ system, and you have to collect all the secret scrolls to access the last level. 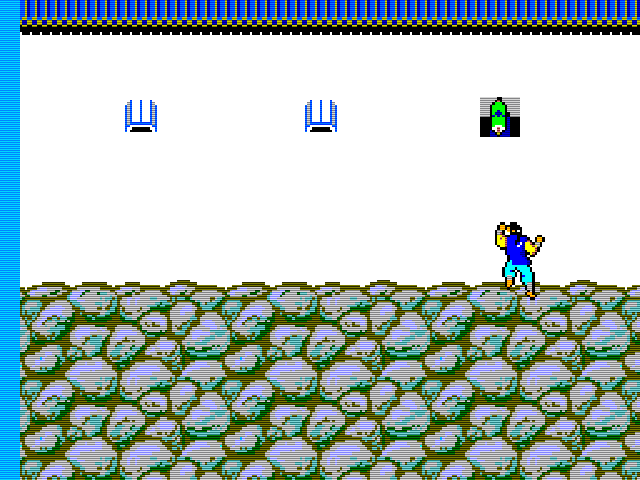 They’re basically randomly located in the levels, so this is probably the most frustrating part. 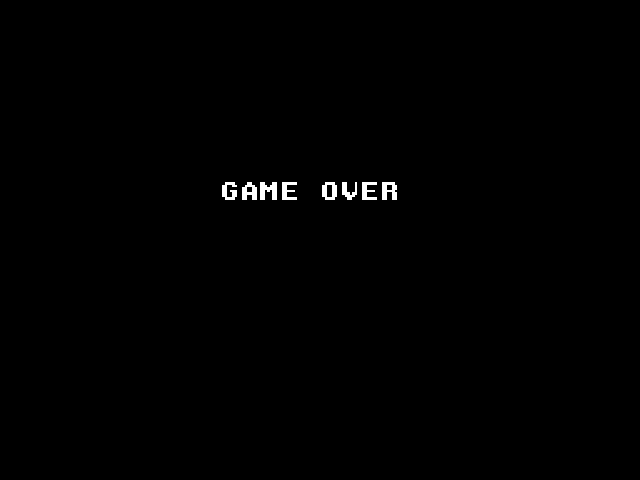 While it had no chance of living up to the arcade original, it’s still very fun, and is one of the best games for the SG1000. 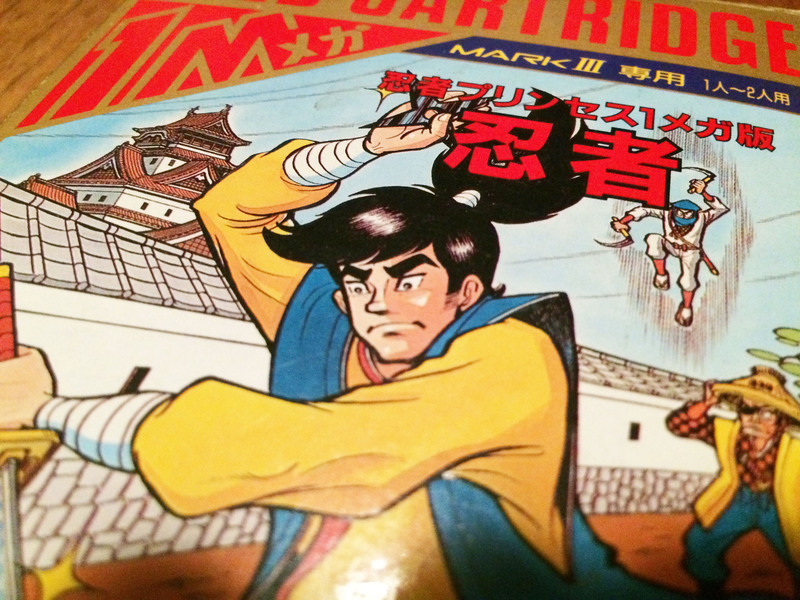 When Ninja Princess finally made it to hardware that could do it full justice – in the form of Sega’s newer Mark III console – it was ostensibly in the form of a sequel. 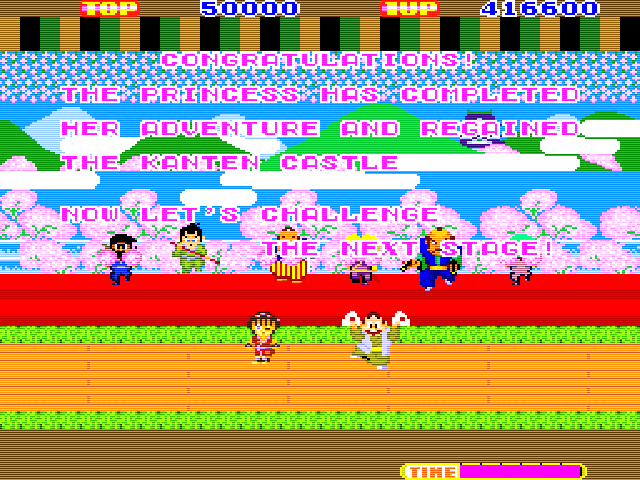 Ninja Princess 1 Mega Han. 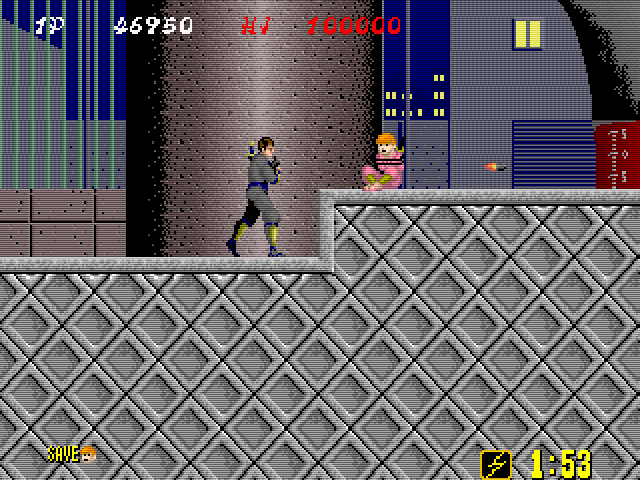 In what was assumedly an attempt to make the game more ‘serious’ (and perhaps appeal to console gaming’s primarily young male audience), the graphical style has been changed completely, removing any hint of the original game’s cutesyness. And instead of starring Kurumi the Ninja Princess, it stars a goofy looking dude named Kazamaru, who now must save the princess. I wonder if Archie and Veronica will like my outfit? 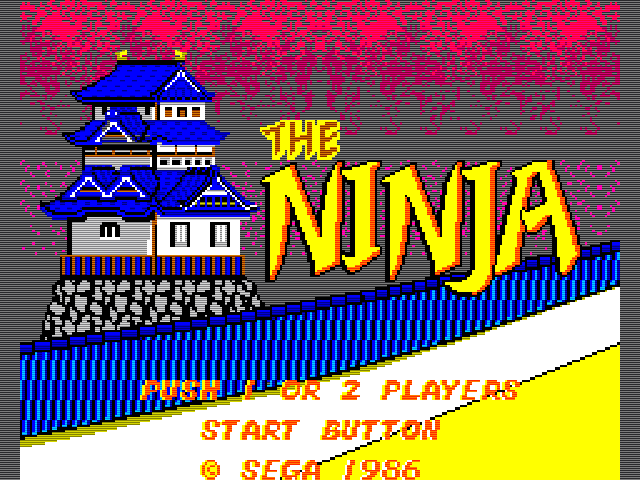 Despite the long-winded title on the box, the title screen shows simply ‘The Ninja’. 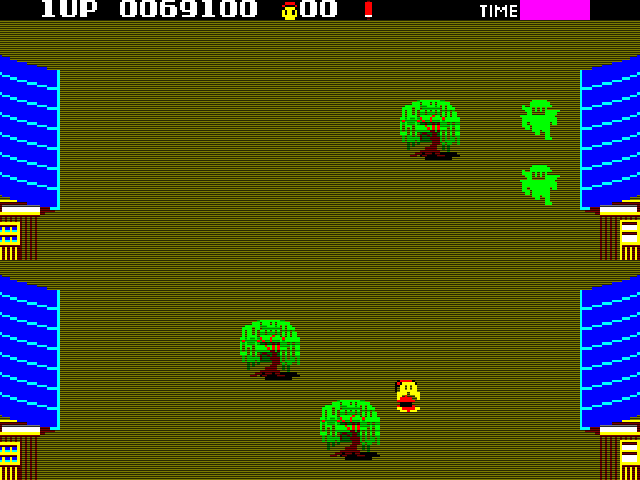 It’s set up as a sequel story-wise, but is actually another, more faithful, port of the arcade game. 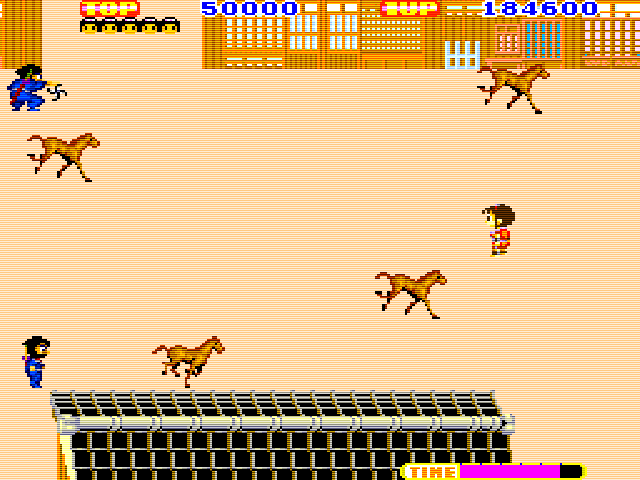 All the arcade event stages are back (in re-drawn form), including the falling boulders, stampeding horses, and river. 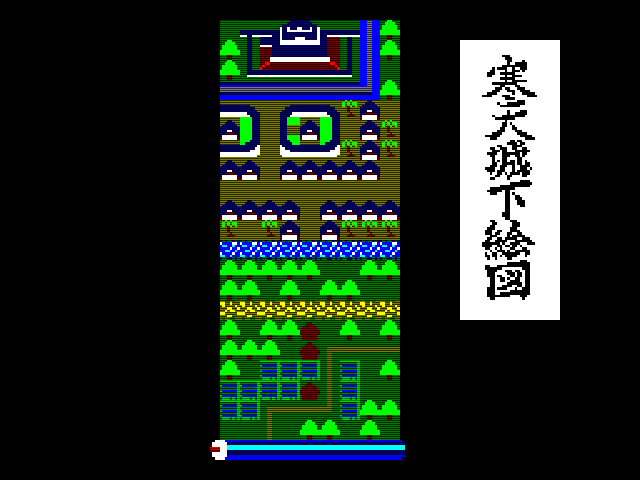 Controls are identical and the scroll system is back from Ninja Princess SG1000, so you have to collect all five scrolls, then perform a particular task at a particular place to access the secret basement level and rescue the princess. There is also a new speed power up scroll. 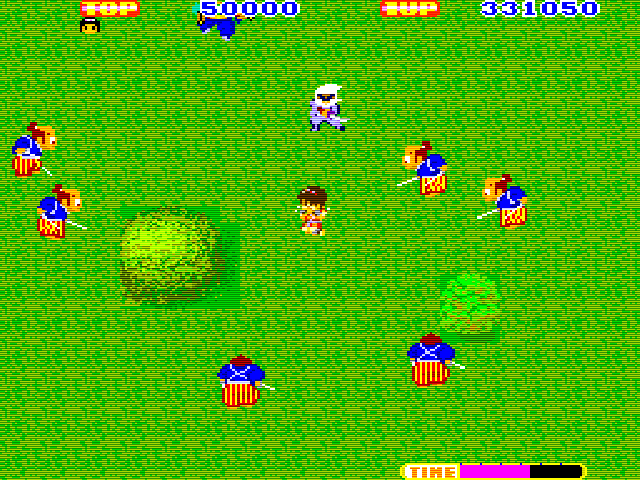 It plays about as well as the arcade, but the new graphics are kind of badly drawn (especially the main sprites, including Kazamaru who looks as awkward in-game as he does on the cover), and the limited cartridge space meant there is much less detail and animation than the arcade game. 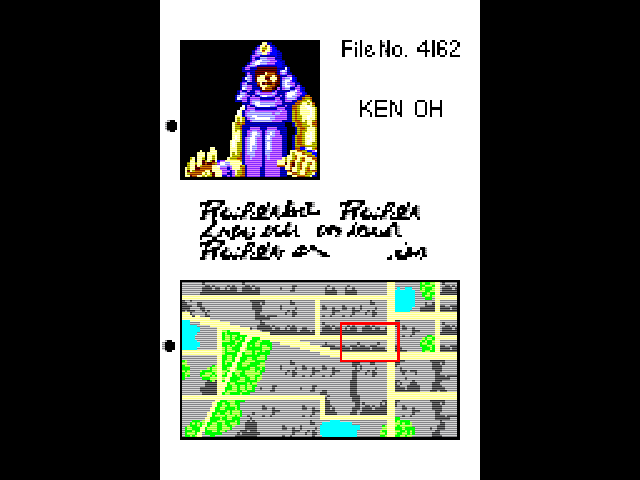 Apart from the odd nicely drawn section, it’s not a particularly good looking Mark III game. There are more musical tracks, but they’re pretty bland, especially when your knives are powered up to ninja stars and you hear the same tune over and over. 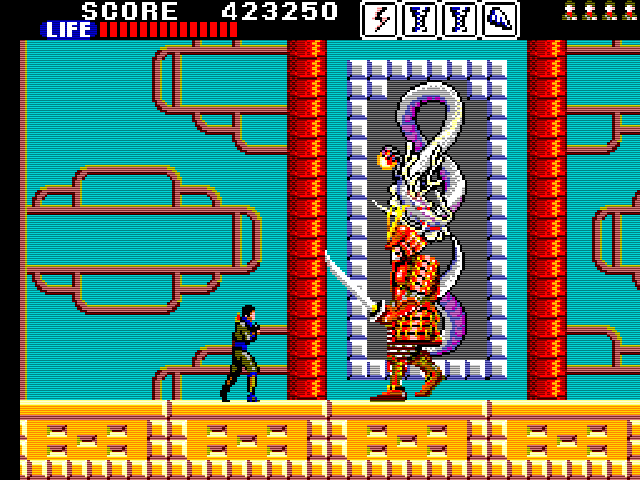 Ninja Princess 1 Mega Han was released in the west under its title screen name The Ninja. 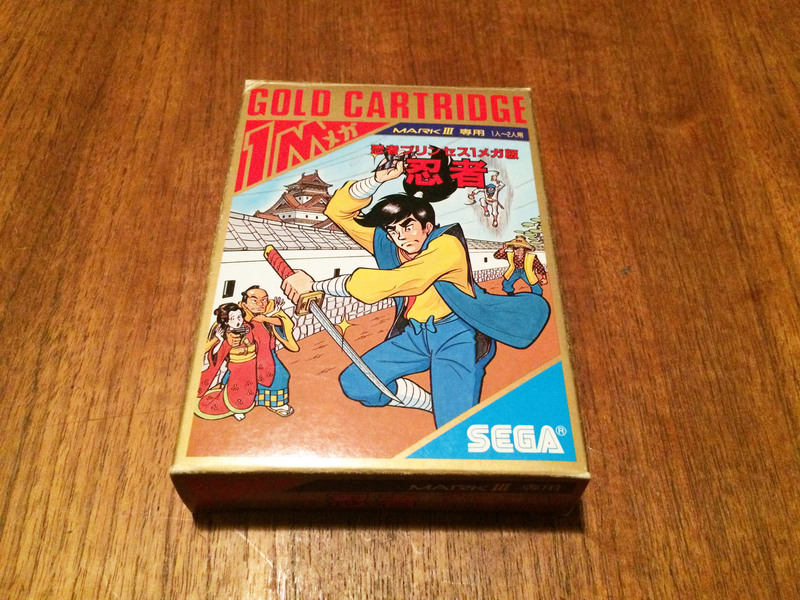 While many Mark III/Master System games contain a universal ROM with both English and Japanese versions of the game onboard, The Ninja was actually ‘upgraded’ for its release outside of Japan. 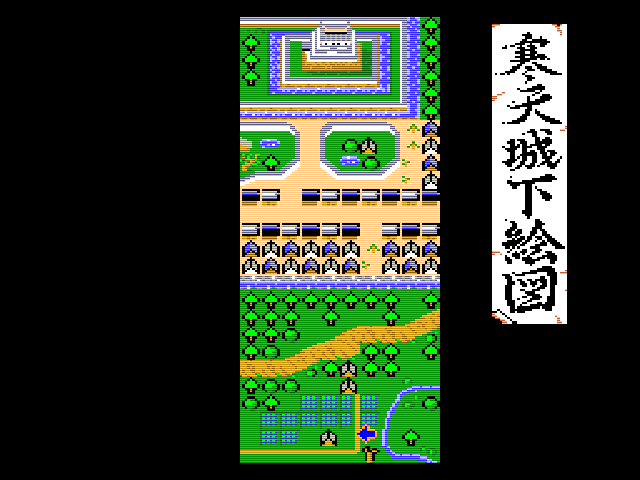 The western release gets a scrolling text intro, a new title screen, and an extra image on the splash screen when you collect all the scrolls. Unfortunately the entire second level is missing, no doubt sacrificed to make space for the above. 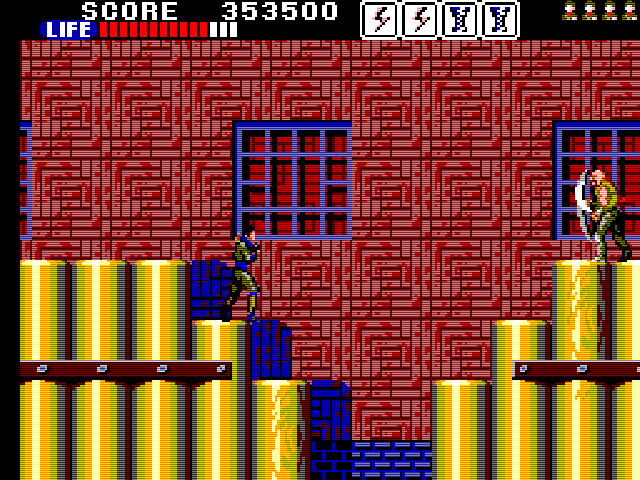 Which is a shame because it’s actually one of the better looking levels. Two of the secret scrolls have also changed location, one in particular makes a heck of a lot more sense in its Mark III location. No village level for you, US/PAL Kazamaru! 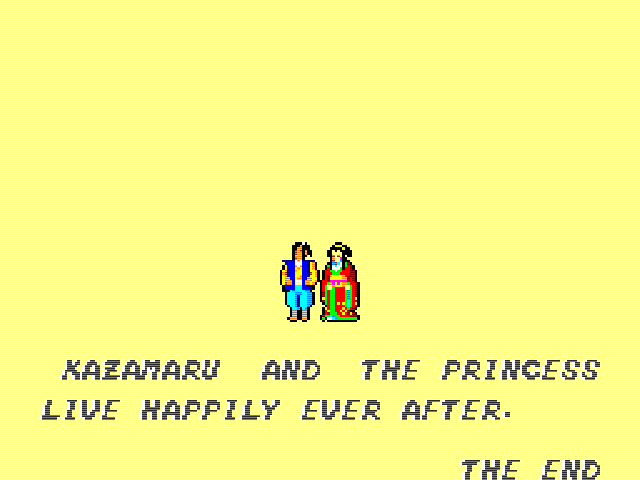 And here the Ninja series ended. 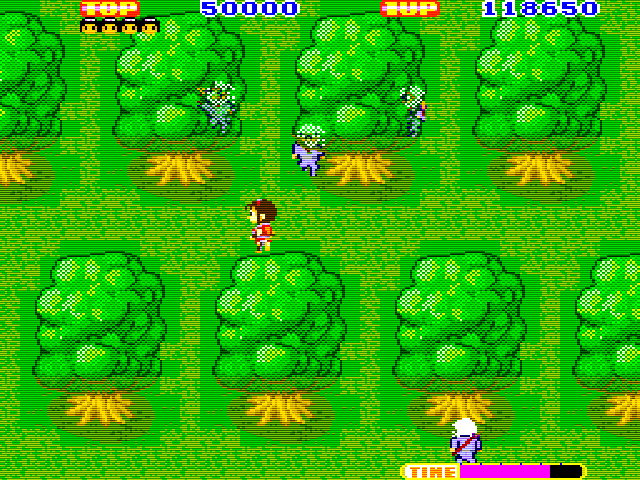 One fantastic arcade game, a very good SG1000 game, and a decent-but-nothing-special Mark III game. They’re worth a play through, but probably the best experience of the series is to be had on the Saturn port of the arcade game. 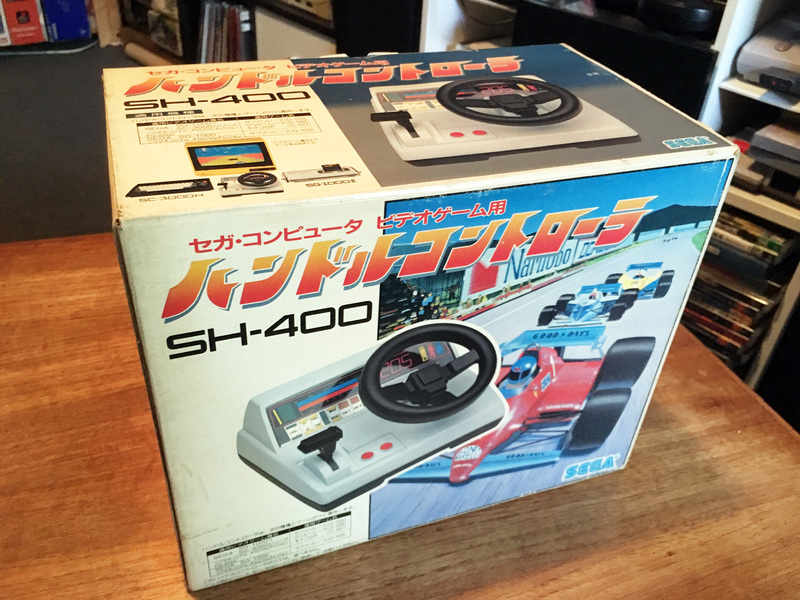 Nintendo and Sega had a famous rivalry in the 80s and 90s. 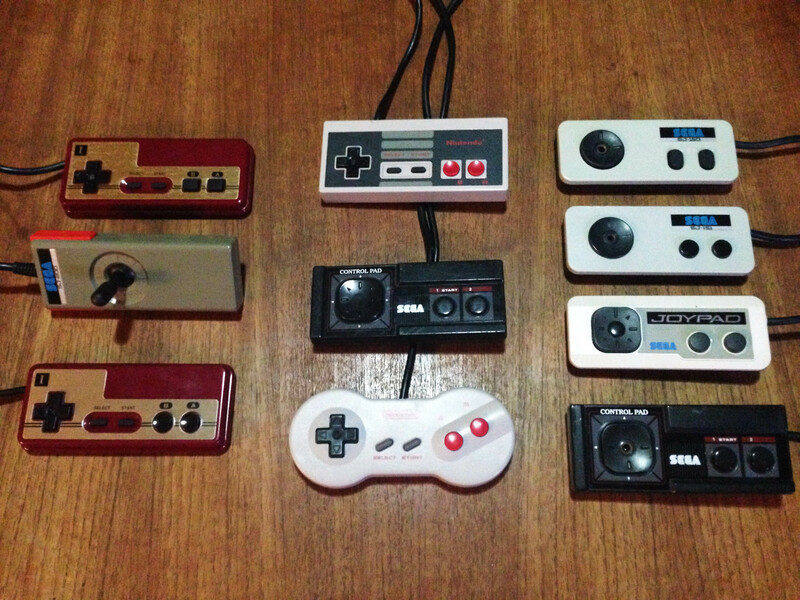 In this post I’ll focus on a single element – the first party controllers of their 8-bit consoles. 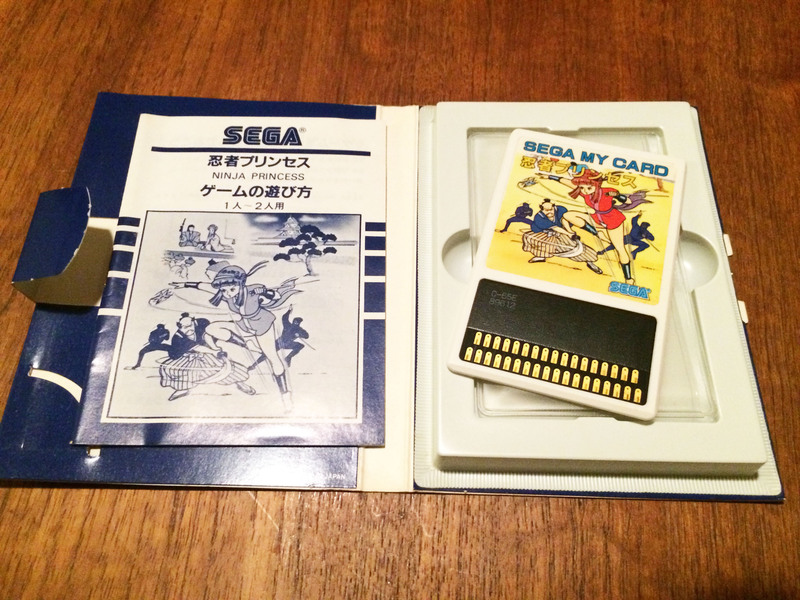 The story begins before either company has released a cartridge based console. In 1982 Nintendo completely reinvents cheap directional input with the calculator style ‘plastic button above rubber membrane’ design of the directional controller pad (d-pad) in the Donkey Kong Game & Watch. 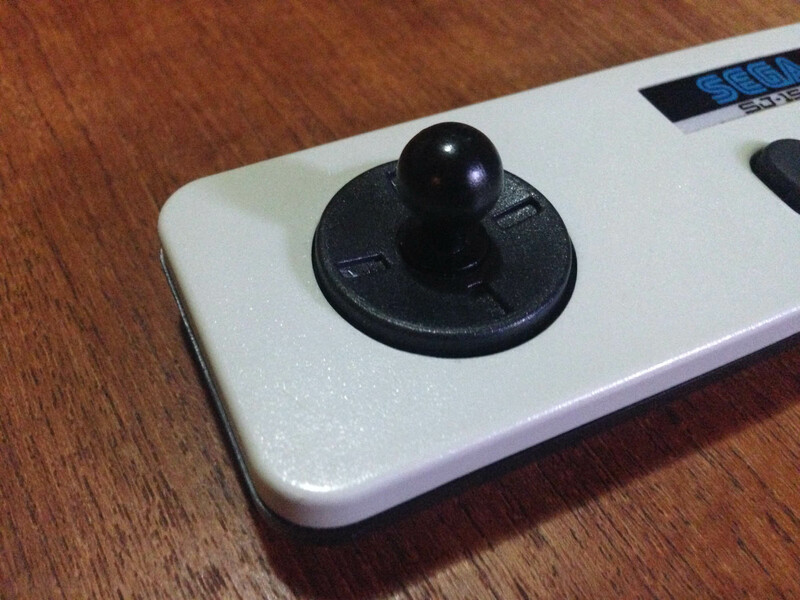 It’s equal to expensive microswitch arcade joysticks in speed, reliability and precision. It has great tactile feedback thanks to the ‘give’ of the rubber. 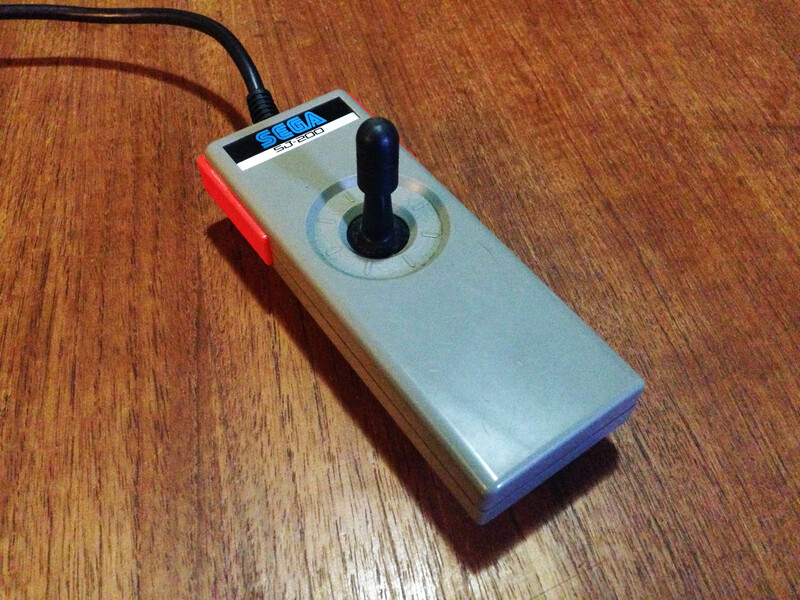 It is a vastly superior solution to the standard Atari-style joysticks of the time, whose sticks and buttons use primitive leaf connectors (bending metal) to register button/direction presses. 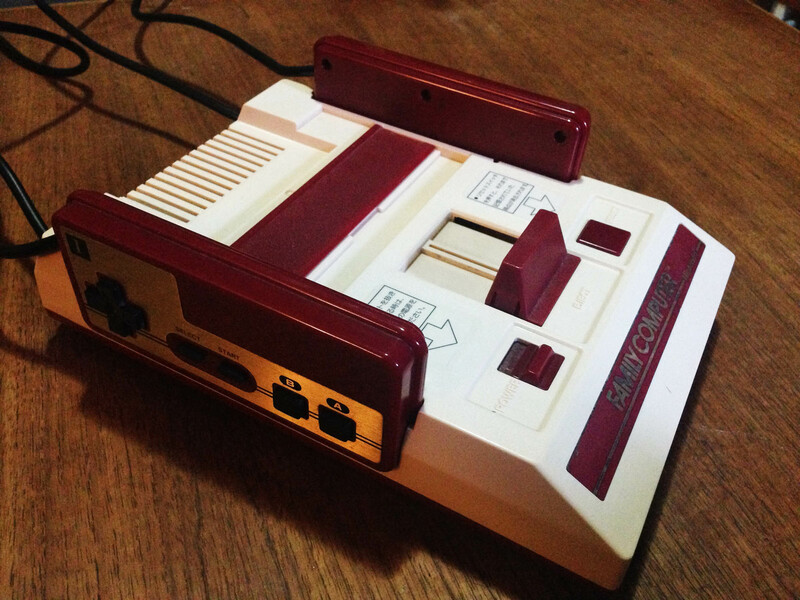 Nintendo releases the first edition of the Famicom. 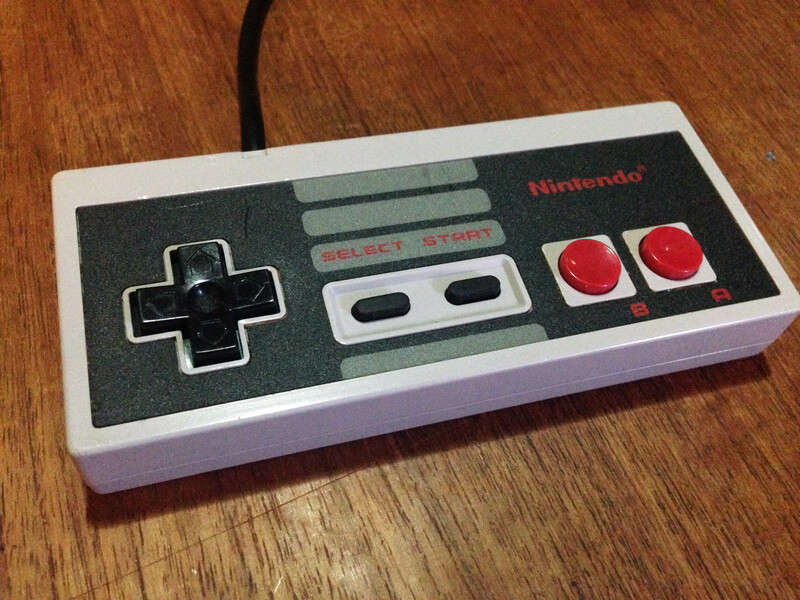 The controllers feature the Game & Watch d-pad, and like Donkey Kong, soft rubber action action (A/B) buttons. 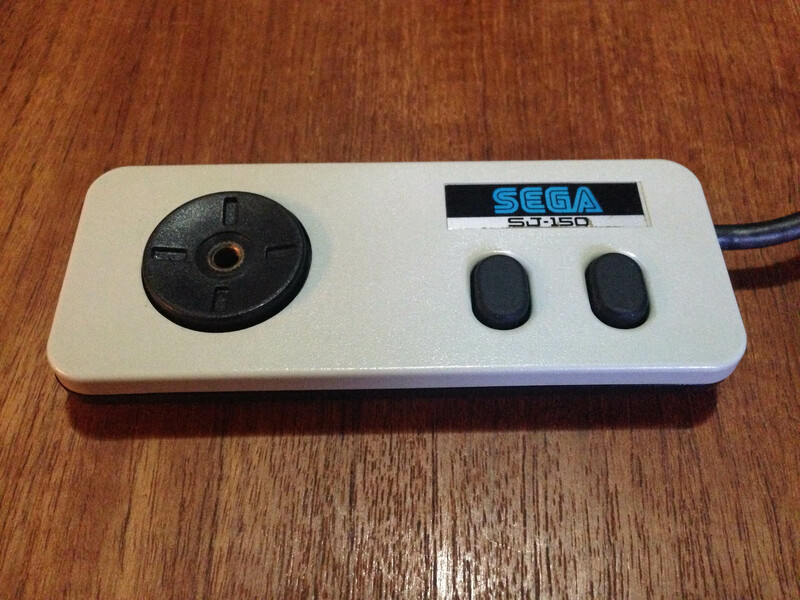 Also like Game & Watches, it features soft rubber function buttons (Start and Select). 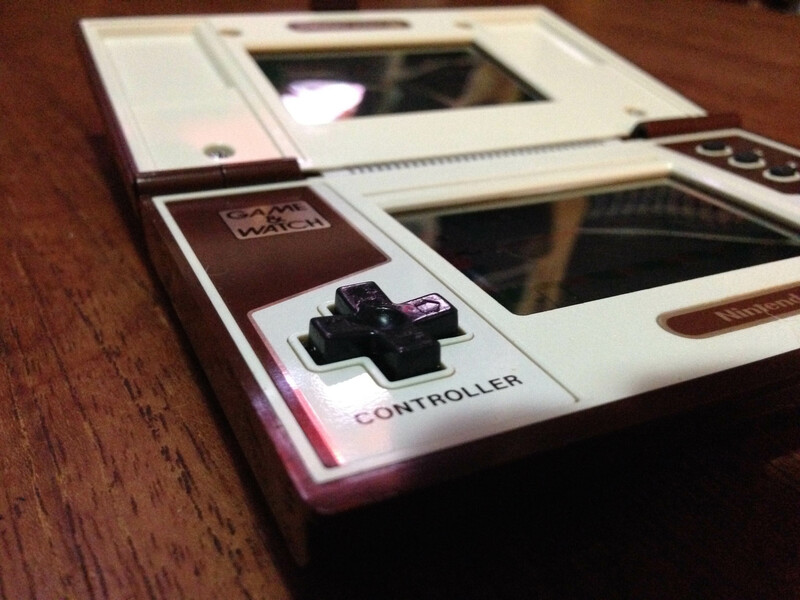 Nintendo continue the ‘metal plate on top of coloured plastic‘ styling of the Game & Watch series. 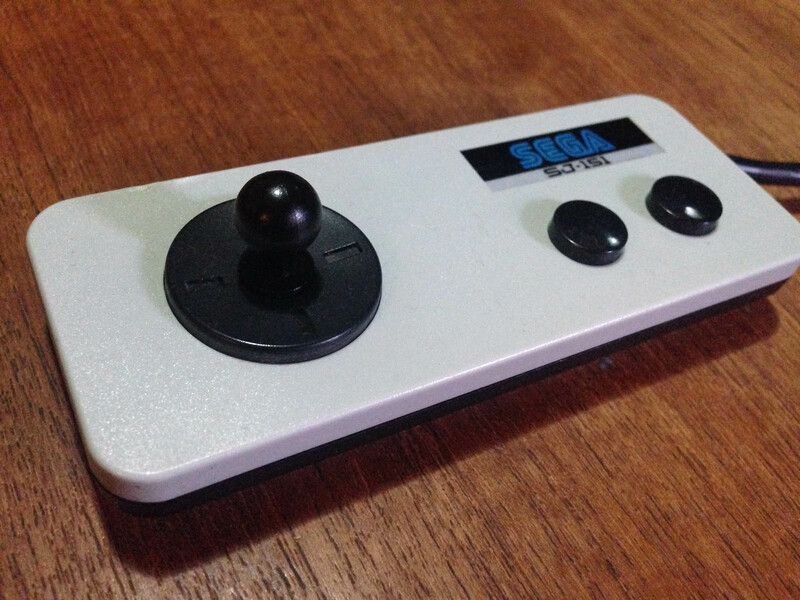 The rubber buttons are usable, and suitable for simpler games, but are not as responsive as the d-pad is, and on hard presses can get stuck on the corners. 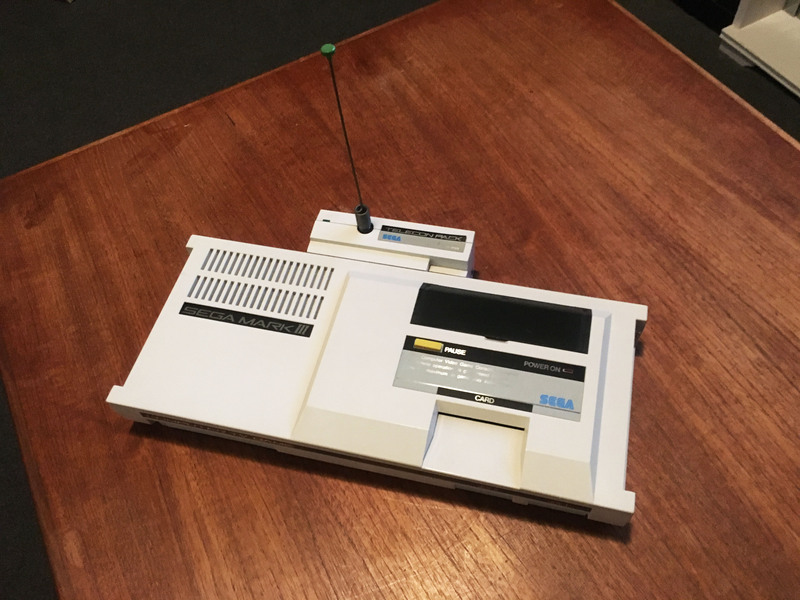 For this reason (combined with a rare graphics glitch issue) Nintendo recalls these models in early 1984 and replaces them for customers. As such they’re relatively rare in the wild. 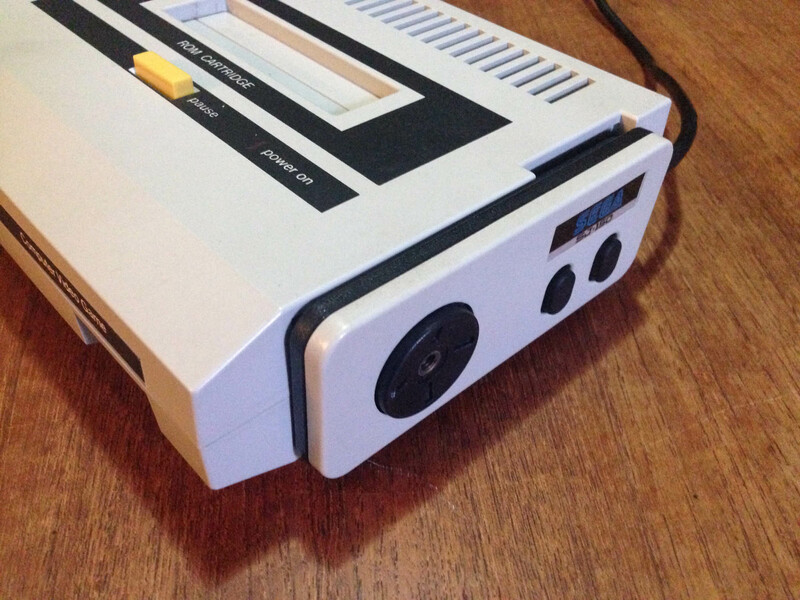 Of note, the Famicom features controller docks on the side of the console, so cords come out the side of the controllers to facilitate this. 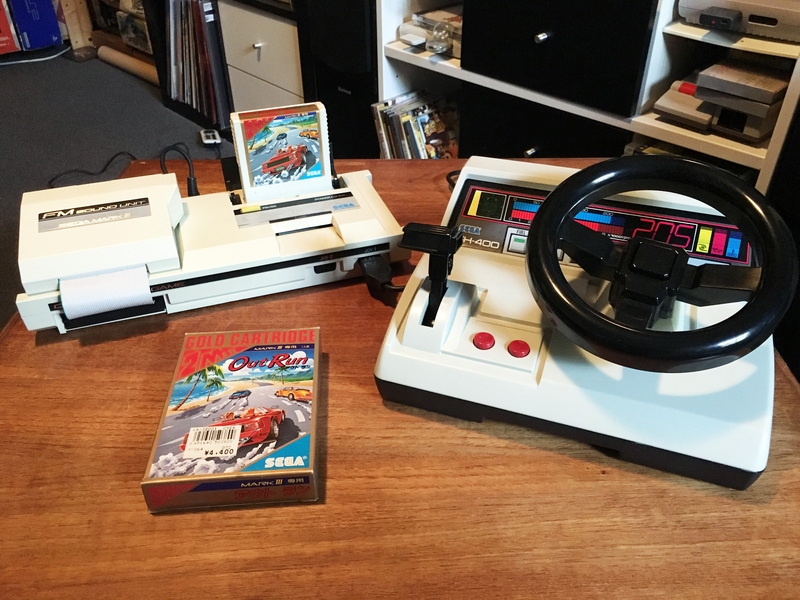 Still 1983, Sega releases the SG1000 console. 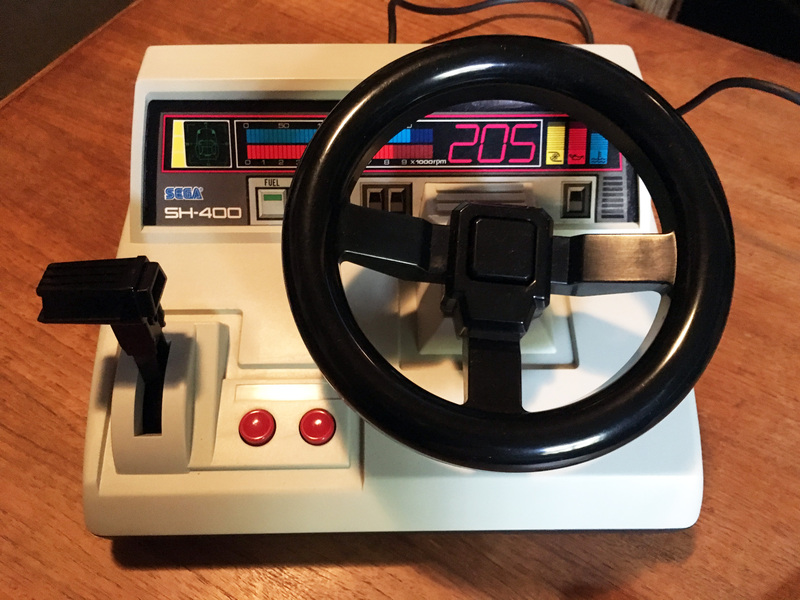 The console itself is a generation behind the Famicom, and the SG1000 controller (SJ-200) is a primitive old-paradigm joystick that uses the unreliable old leaf connectors. 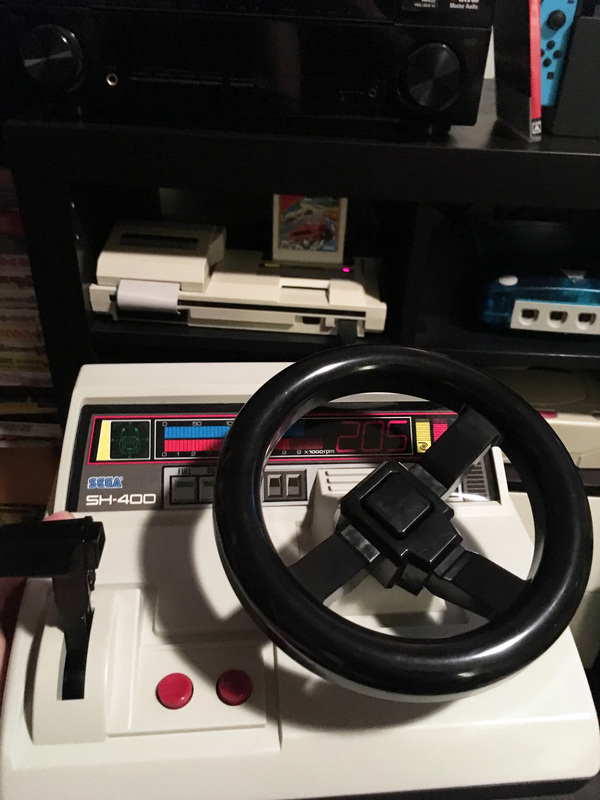 It also only has two buttons to the Famicom’s four (the console itself features a ‘Hold’ (pause) button on the main unit). It’s an absolutely terrible controller. 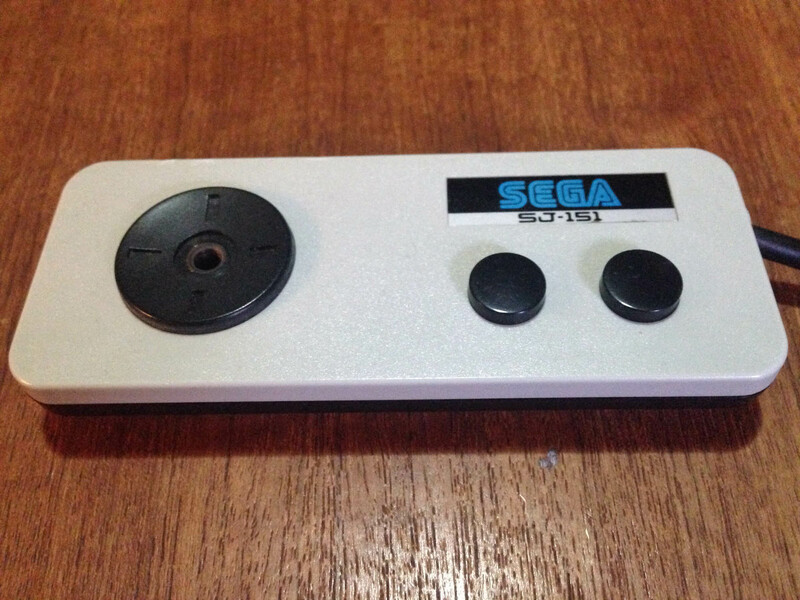 The mini joystick is equally as bad as an Atari VCS joystick, but cannot be as easily wrenched around to ‘force’ it to work like an Atari one, due to the small size and the way you hold it. Nintendo updates the Famicom controller to have hard plastic over rubber membrane A/B buttons for better responsiveness. They leave the less commonly used function buttons as soft rubber. A brilliant controller that basically sets a permanent industry standard. 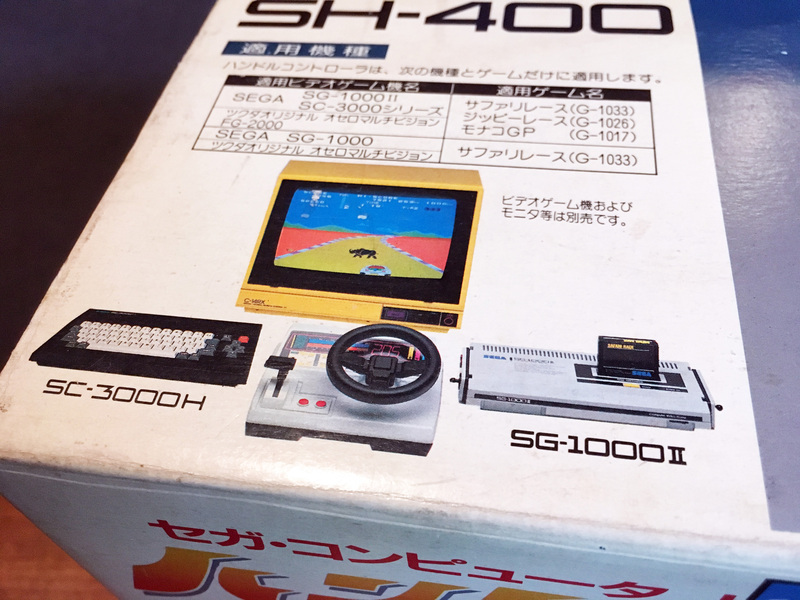 Later in the year, Sega releases the redesigned SG1000 II console, with the Famicom inspired SJ-150 controller. 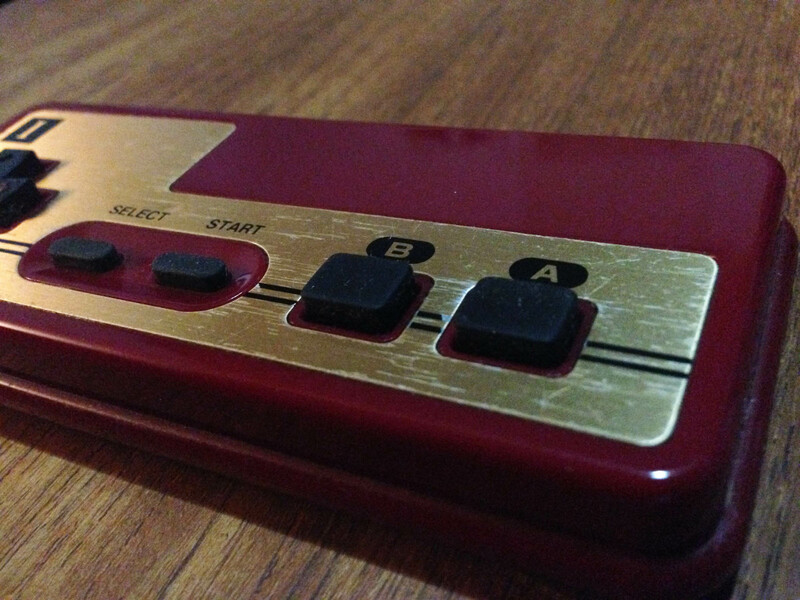 The SJ-150 has a round variation of the Famicom d-pad, and a copy of the original Famicom soft rubber A/B buttons. 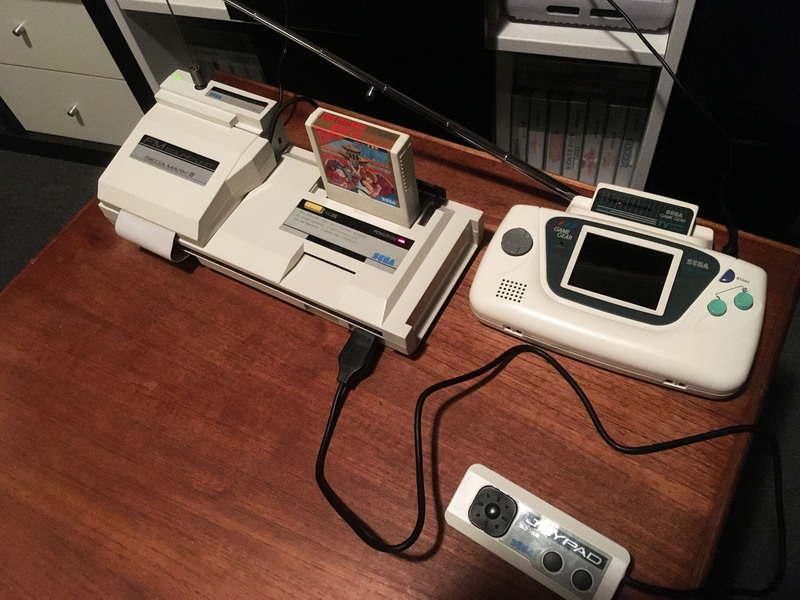 The new console ditches the unique look of the original SG1000, and takes more than a few design cues from the Famicom, including controller docks on the side of the console. 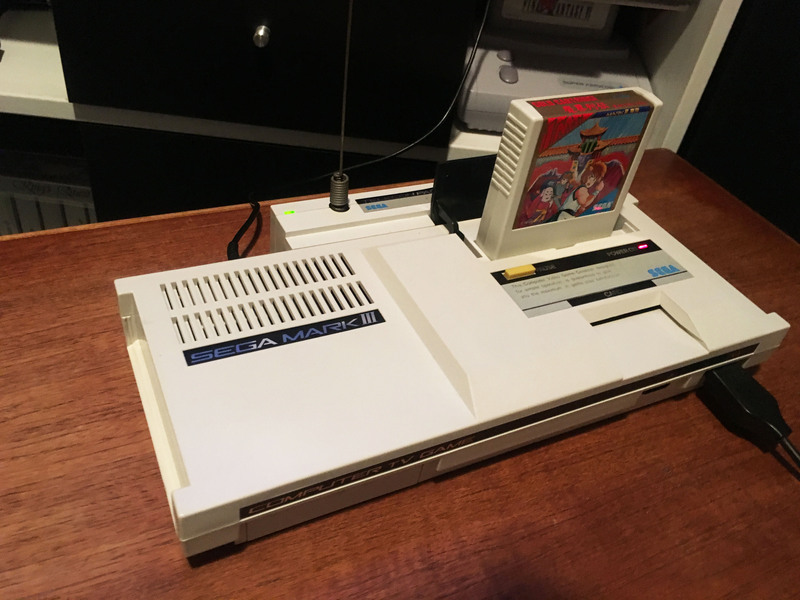 Controllers are detachable from the console unlike the Famicom, but they plug in at the back, using an Atari-style DB-9 connector – a legacy of the original SG1000, which had a DB-9 plug for an optional second controller. 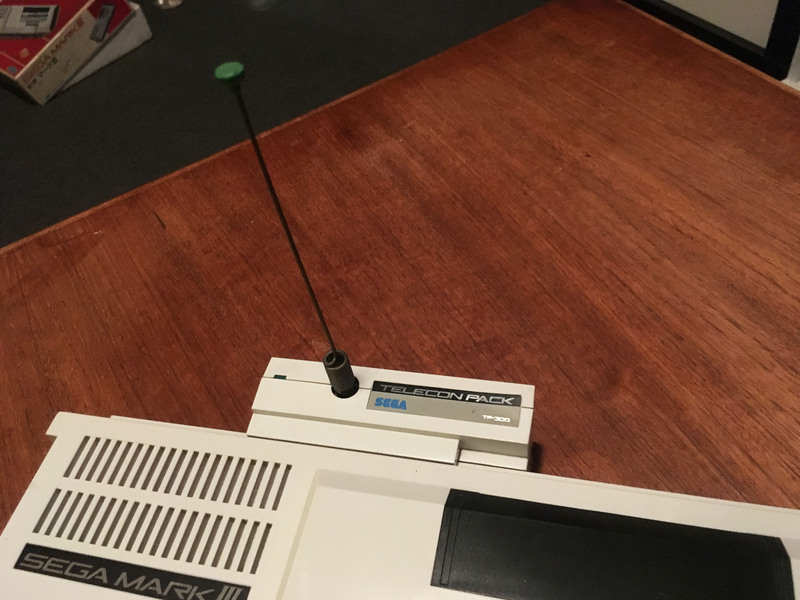 Interestingly, the SJ-150 tries to keep one foot in the old ‘joystick’ world, and comes with a little plastic stick which can be screwed into the middle of the d-pad, presumably for players who want some kind of joystick feel. 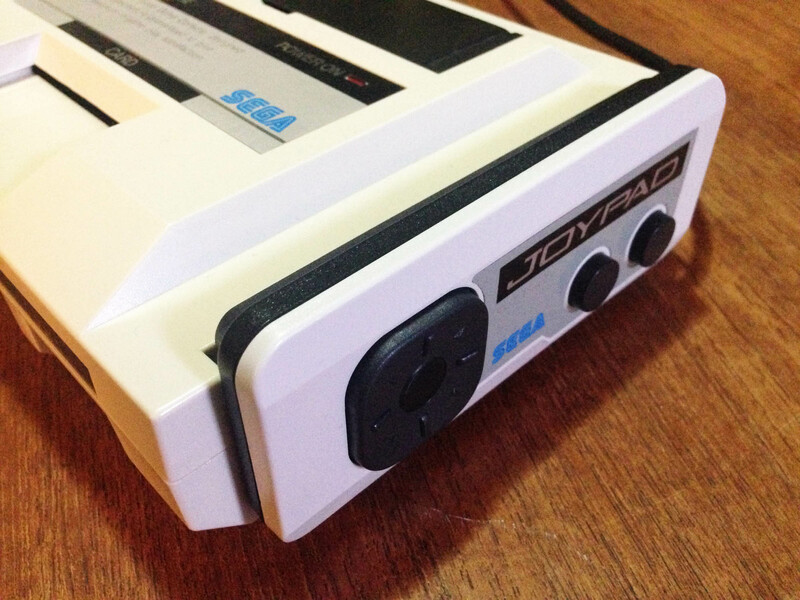 Sega releases the SJ-151 controller with later SG1000 II consoles, and it is moved up to the latest Famicom design, with hard plastic with rubber membrane A/B buttons. 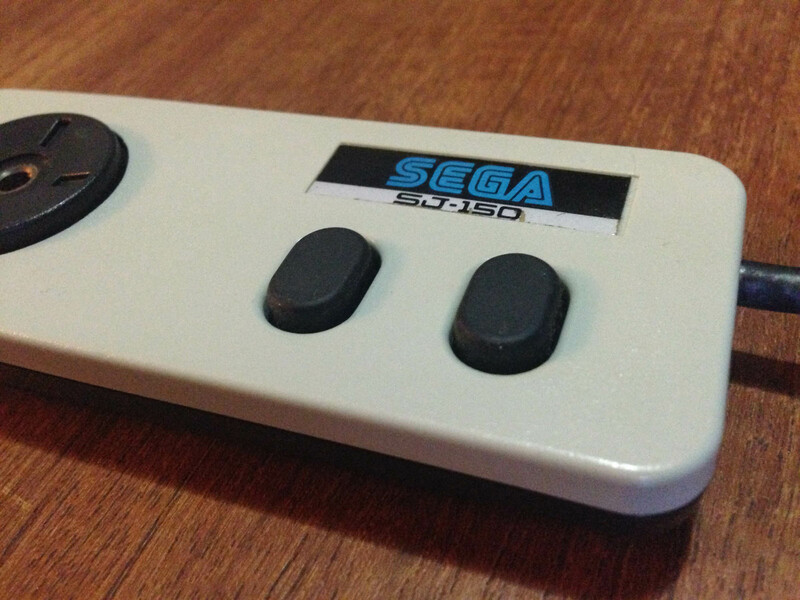 This is the first all-round good Sega controller. 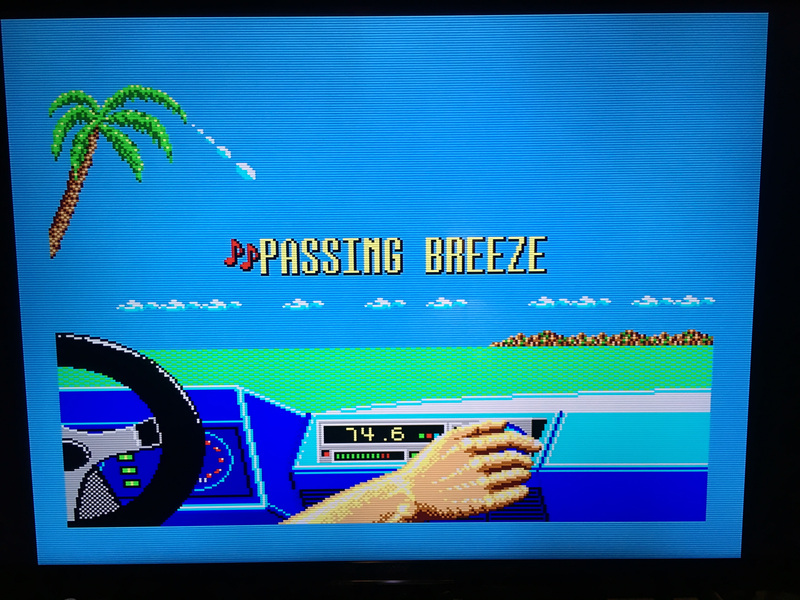 It keeps the weird mini-joystick option. 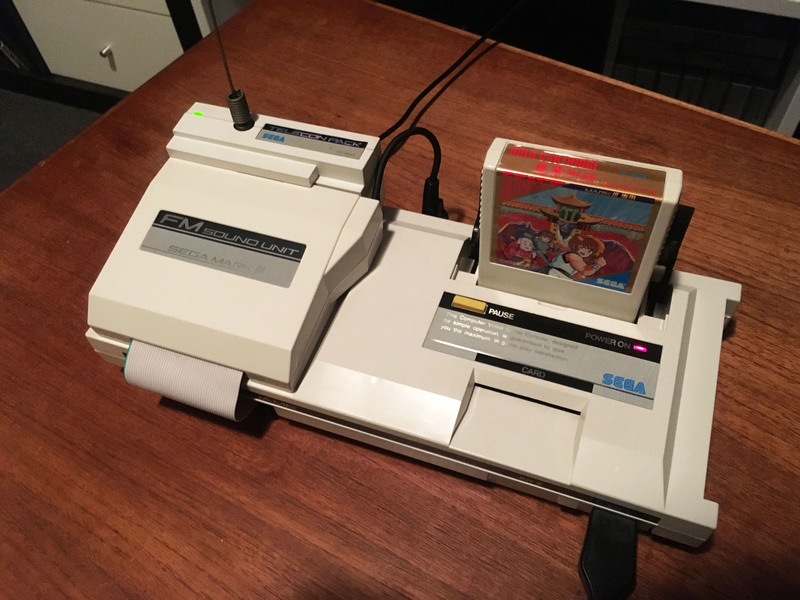 Later in 1985, Sega releases their upgrade to the SG1000 – the Mark III, with the SJ-152 controller, which is basically just a redesign of the SJ-151. 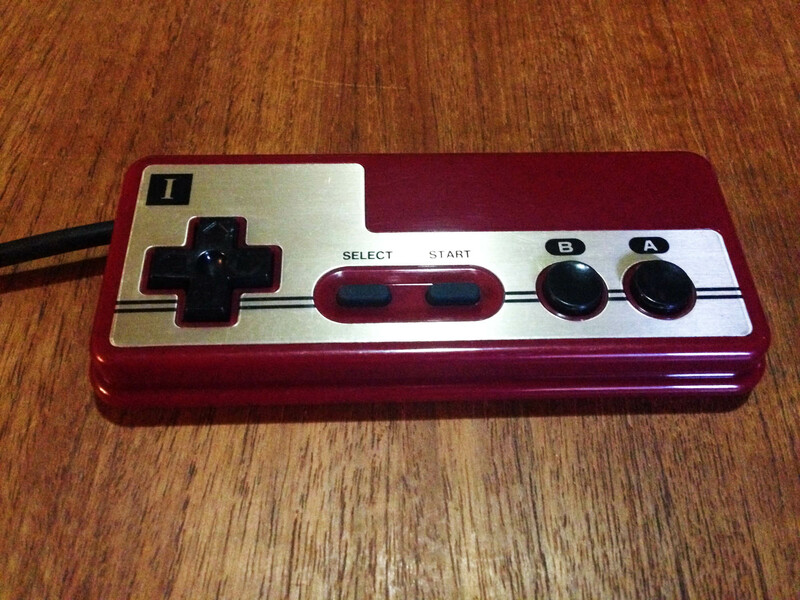 It has more Famicom-like styling, with a reflective metallic sticker on the top mimicking the metal faceplate of the Famicom controller. 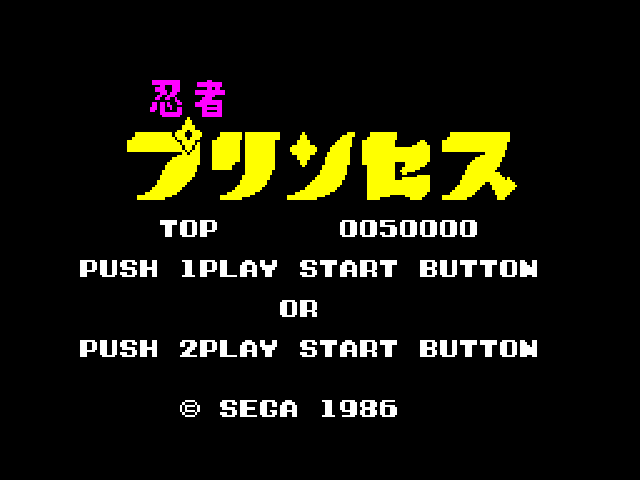 Possibly due to the SG1000 legacy of the Mark III hardware, Sega is stuck with only two buttons for each controller. 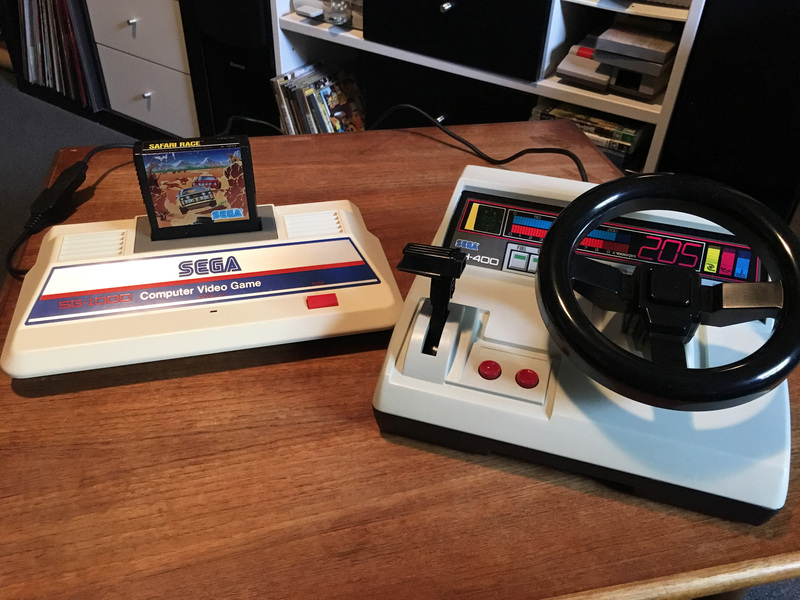 The console continues to feature controller docks like the Famicom, though the controllers now plug into the front of the console. 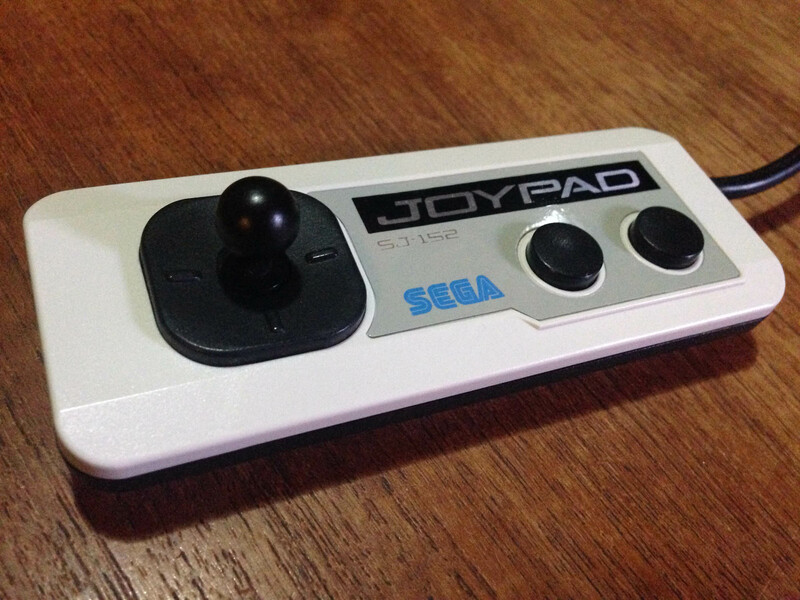 It also retains the mini-joystick option. Someone must have liked it. Later in 1985, Nintendo brings the Famicom west as the NES, with an externally redesigned (more squared off) controller that keeps all internals of the hard button Famicom pad as-is – it even uses the same board. 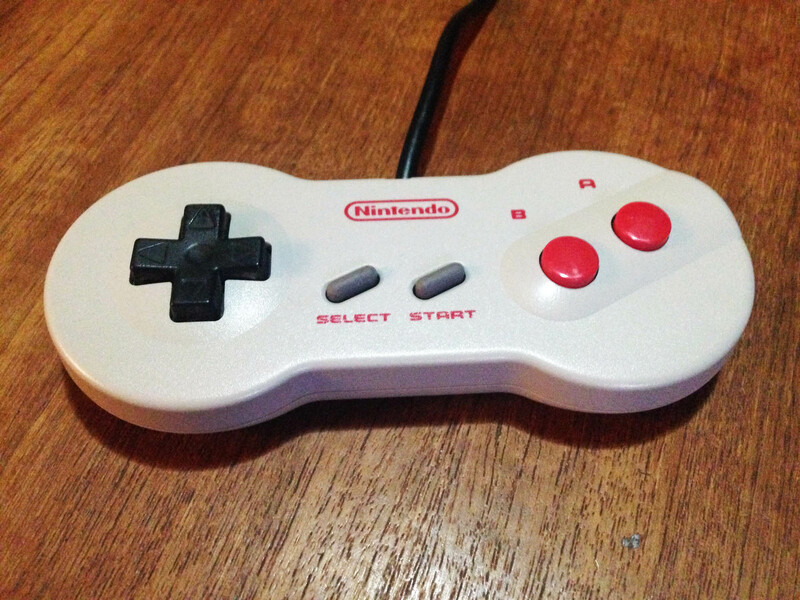 Due to the NES having no controller docks, Nintendo improves on the Famicom pad design slightly by having the cord come out the top instead of the side of the controller. 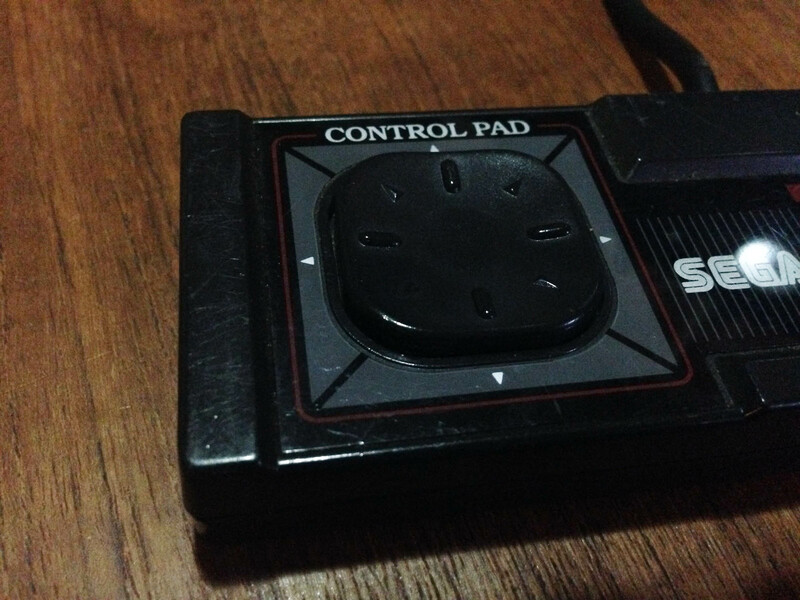 It is however slightly less comfortable to hold due to the harder edges; the Famicom controller was nicely rounded. 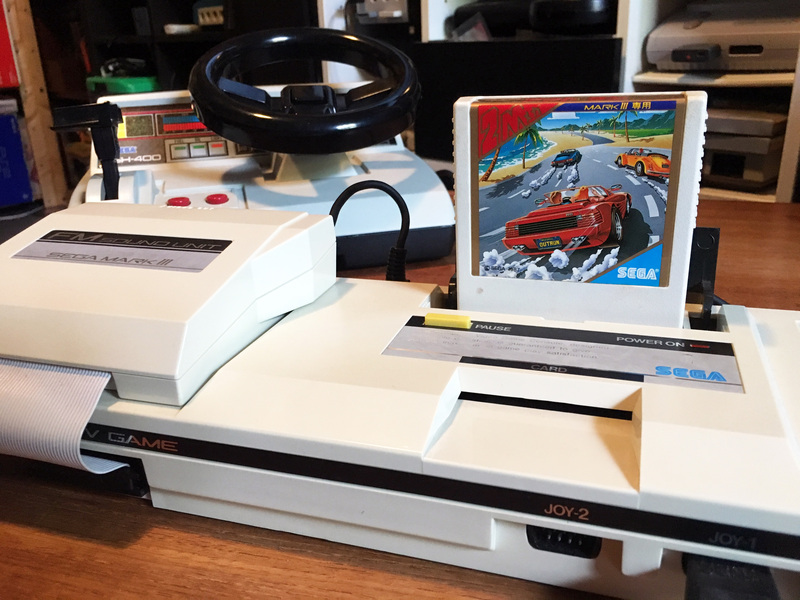 Sega brings the Mark III west as the Master System, with an externally redesigned (more squared off) controller that keeps all the internals of the Mark III pad as-is – it even uses the same board. 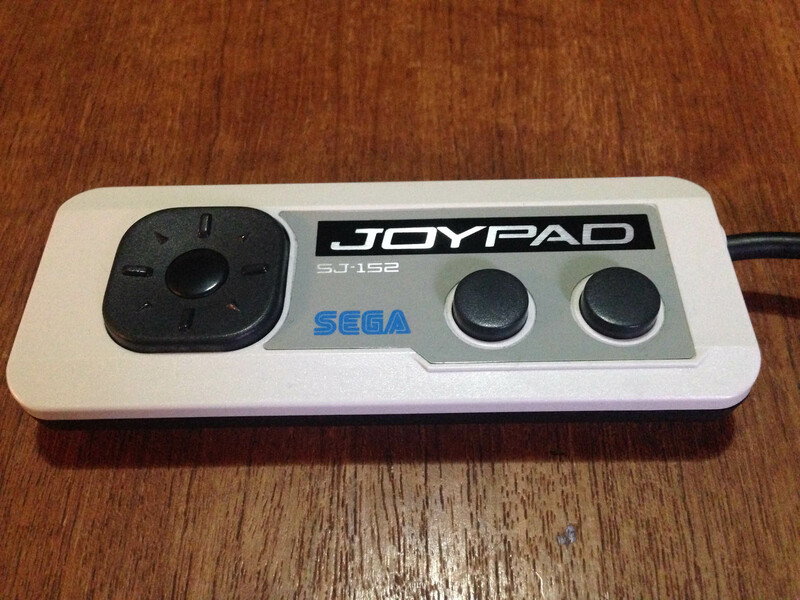 It has some weird raised sections making hitting the buttons and d-pad less comfortable, though the d-pad is still the half decent one from the SJ-152. It is also less comfortable to hold due to the harder edges. 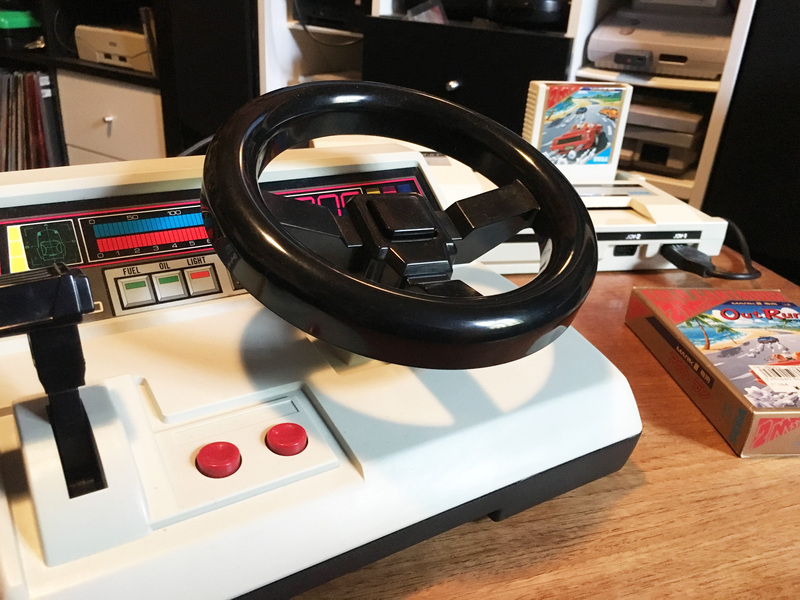 Unfortunately, despite the Master System having no controller docks to necessitate it, the cord still comes out the side. 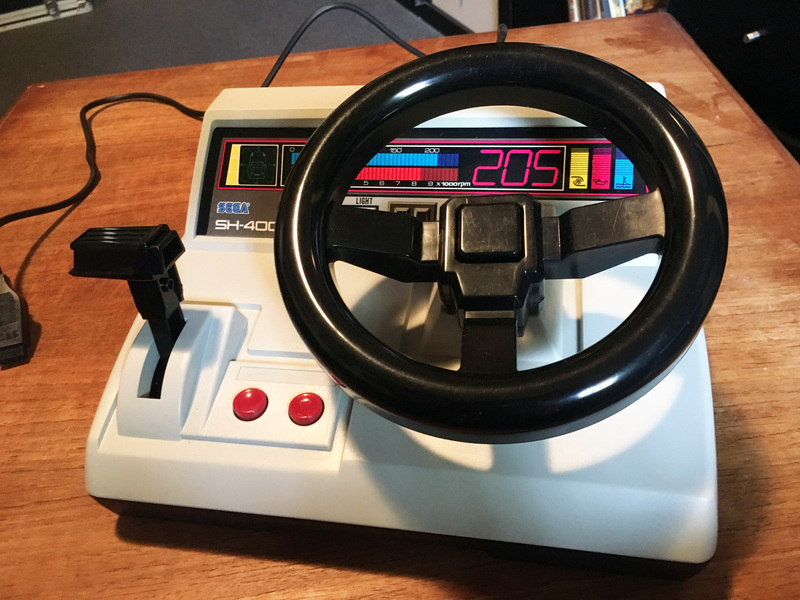 It still has the mini-joystick option. 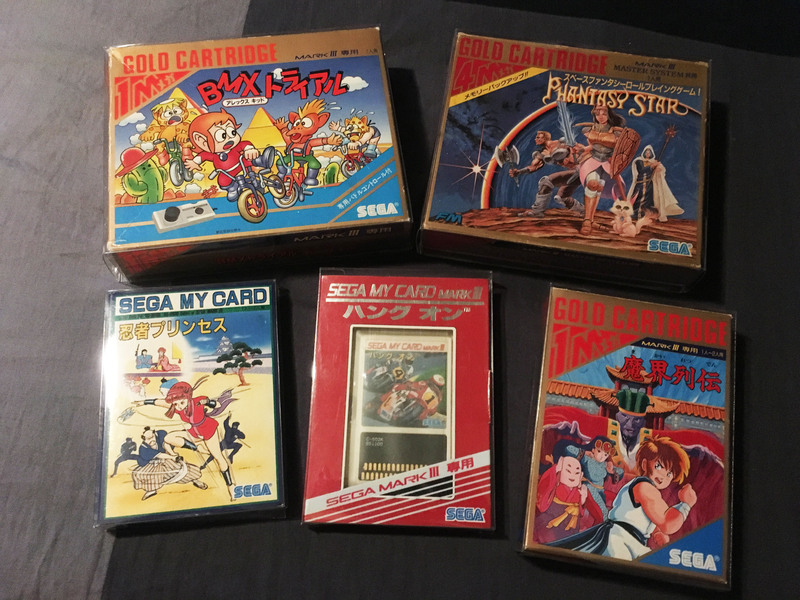 After the release of Sega’s next system the Mega Drive, Sega begins positioning the Master System as a budget system in some of their more successful territories (mostly Europe and Australia/New Zealand). 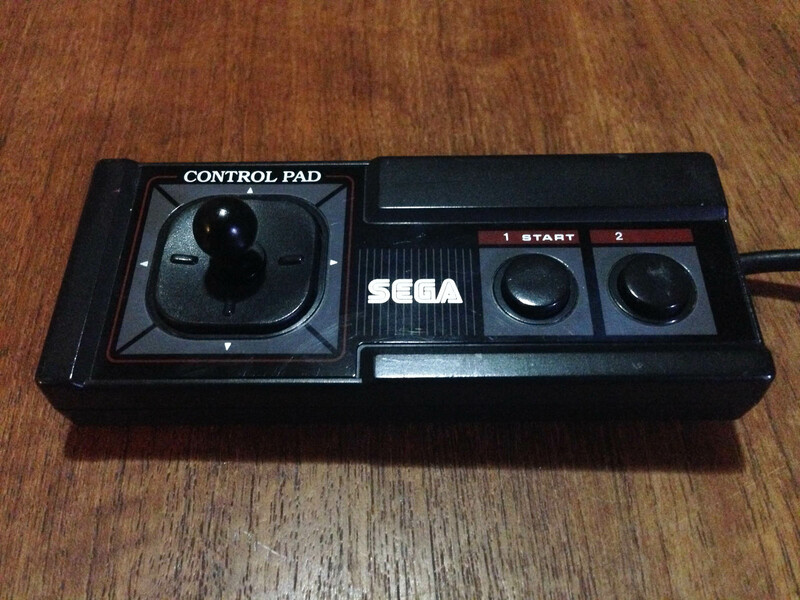 They revise the Master System pad to have the cord come out the top like the NES, and finally drop the mini joystick attachment. 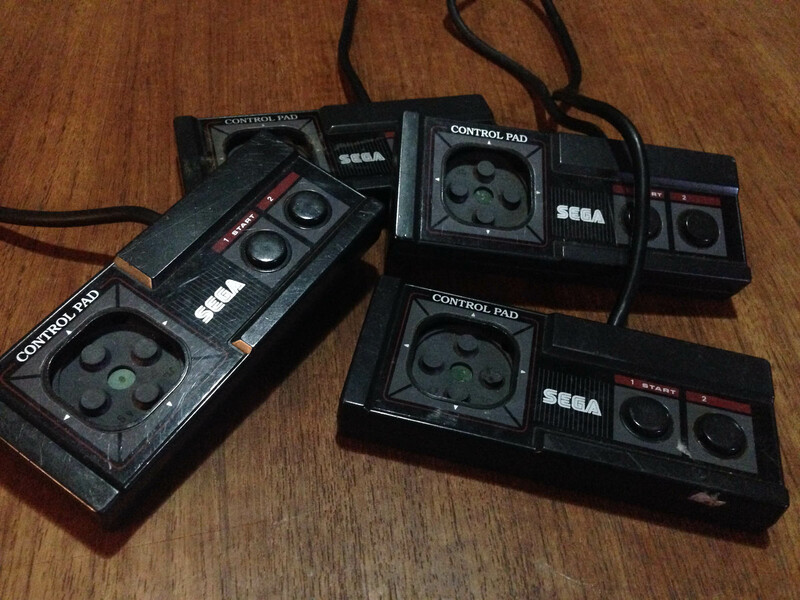 At some point along the way Sega farm out all Master System production to China, and the non-Japanese controllers (and consoles) were much lower quality, and broke incredibly easily. Especially the d-pad, which had a cost-cutting redesign, making it less responsive as well as more prone to breaking. 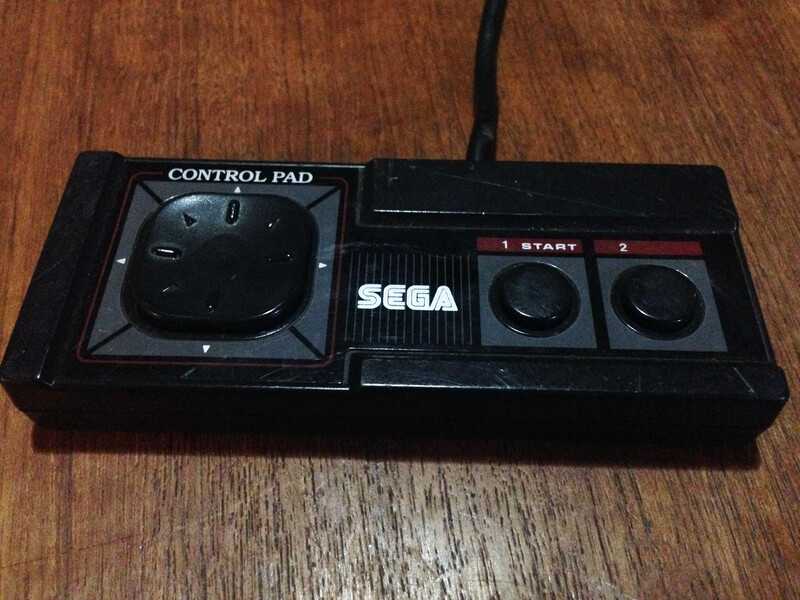 No first party controller breaks as easily as the ‘top cord’ Master System pad. 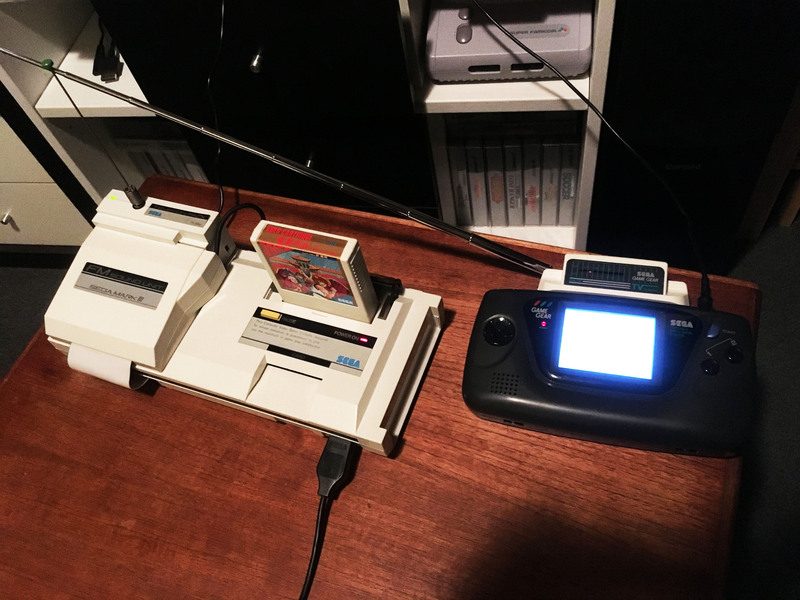 After the release of the Super Famicom/Super NES, Nintendo repositions their older Famicom console as a budget machine – in Japan as the ‘AV Famicom’ and as a Top loading NES model in the USA/Europe. 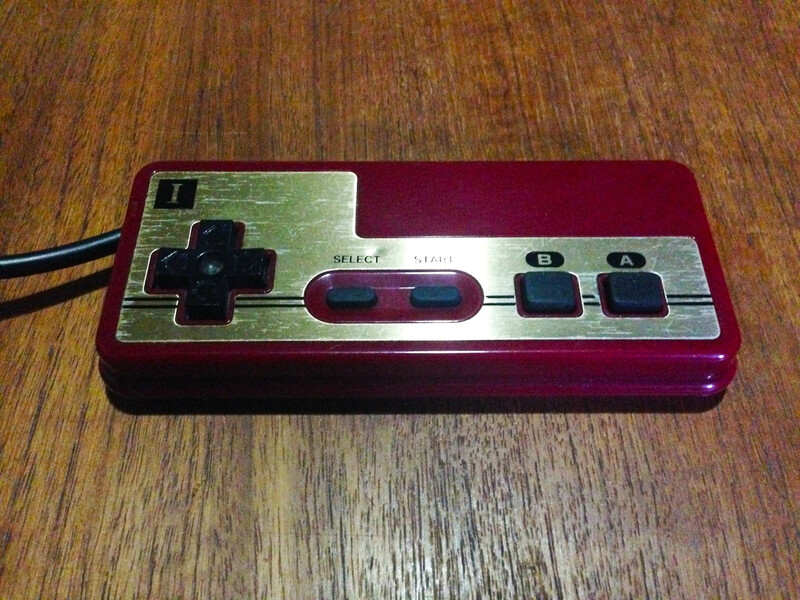 The new Famicom/NES comes with a new Game Boy/Super Famicom inspired controller, affectionately known as the ‘dogbone’. It’s a great controller, a very high quality build, and easily the most comfortable controller of the generation. 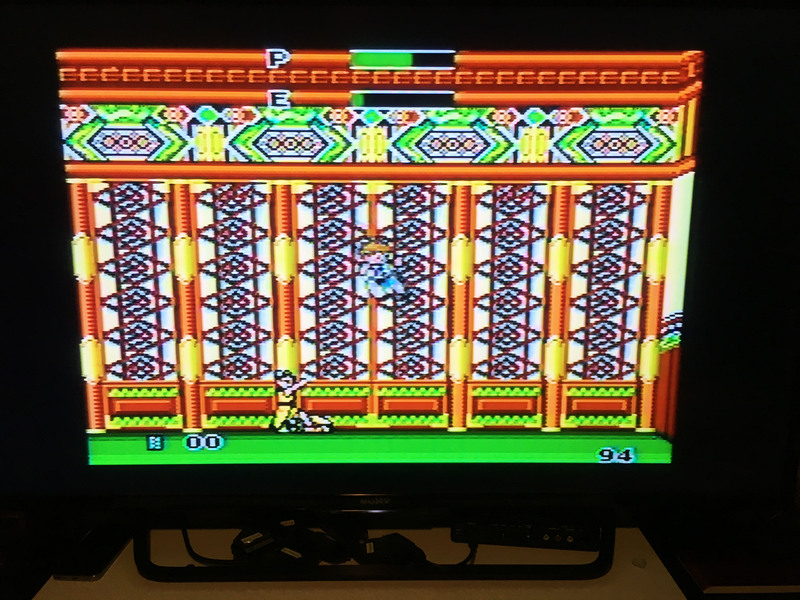 Some players prefer the ‘flat’ AB button orientation over the Game Boy/SNES-style angled orientation. I prefer the angle. And that’s where that battle ended. 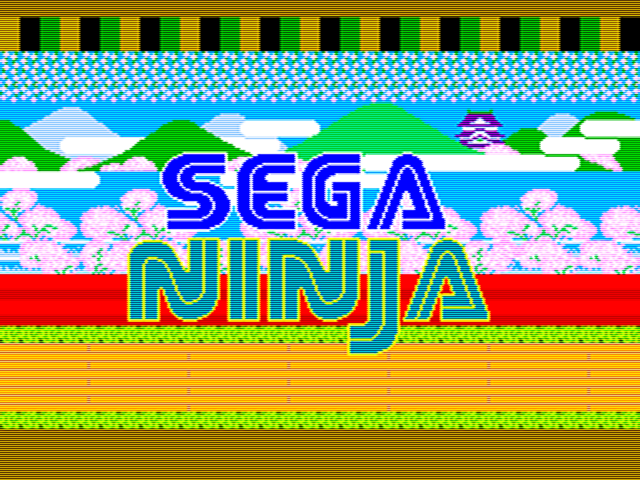 Poor Sega were 1-3 years behind at every single step. Here’s the whole lot in one shot. 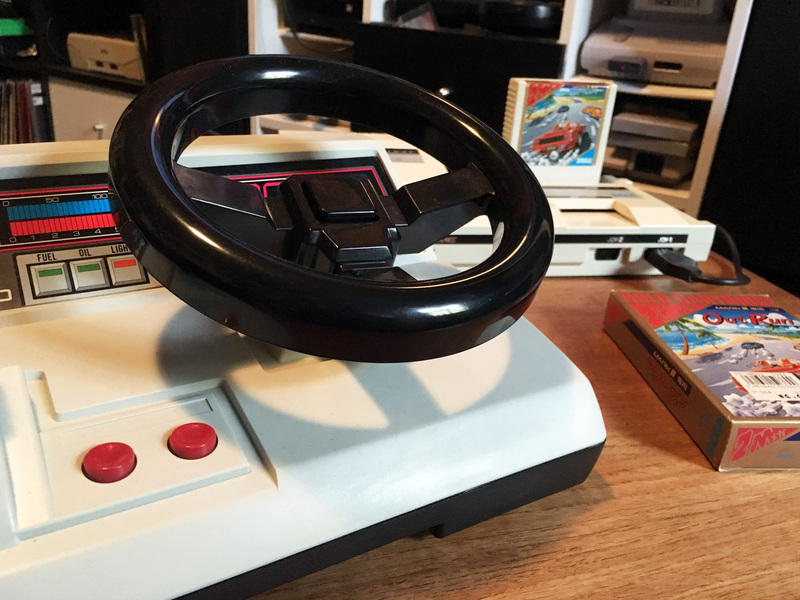 My favourite Nintendo controller is either the beautiful round button Famicom pad (or my hybrid Famicom/NES controller), or the dogbone. 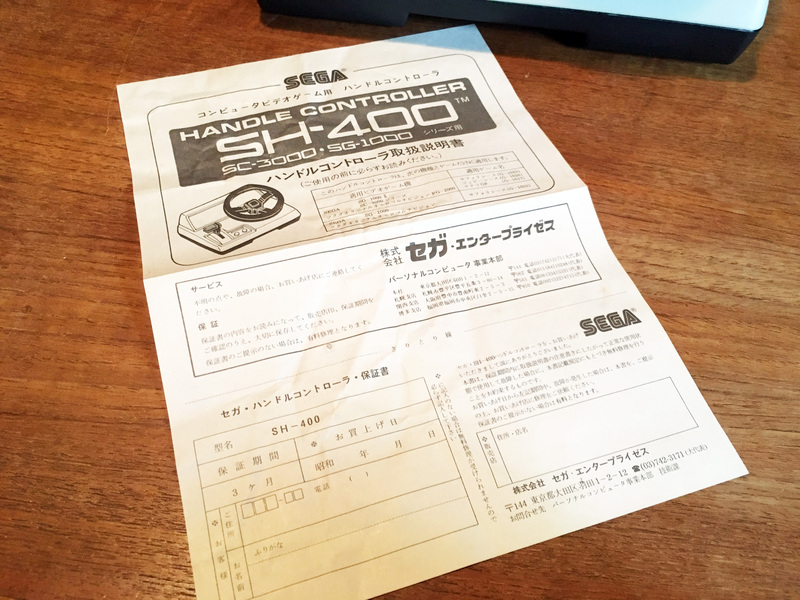 My favourite Sega controller is probably the SJ-151. It has the better buttons, and the round d-pad works just a little better – the square one has a bit too much face surface. 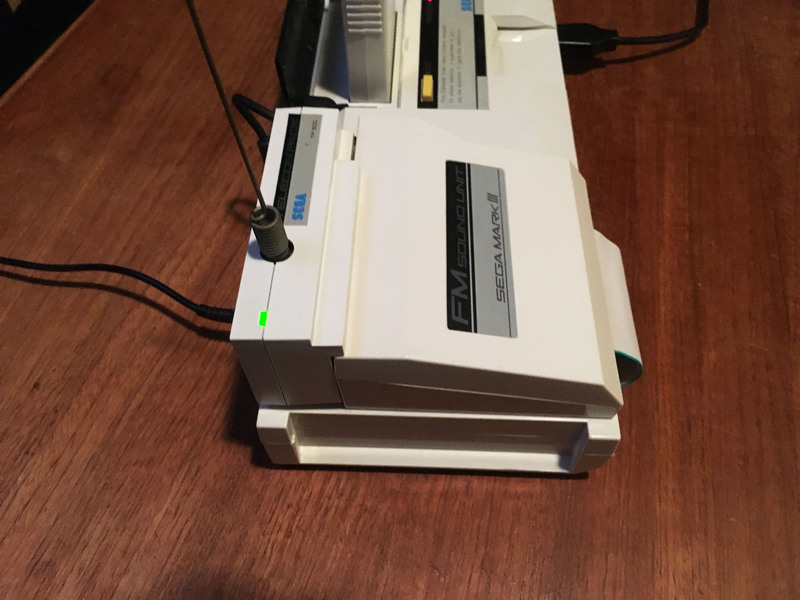 The SJ-152 is also quite decent, and it looks less plain. There’s a Mark III 3DS theme out. 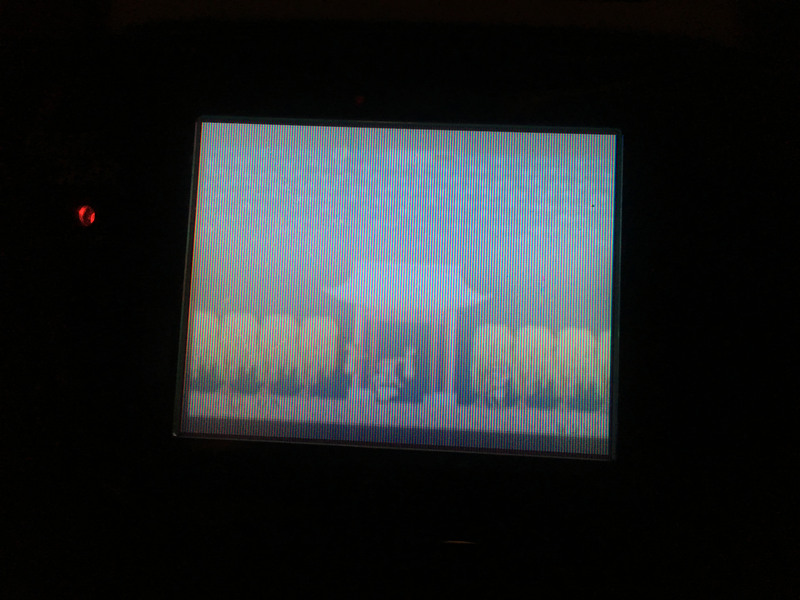 Looks perfect on a white New 3DS. 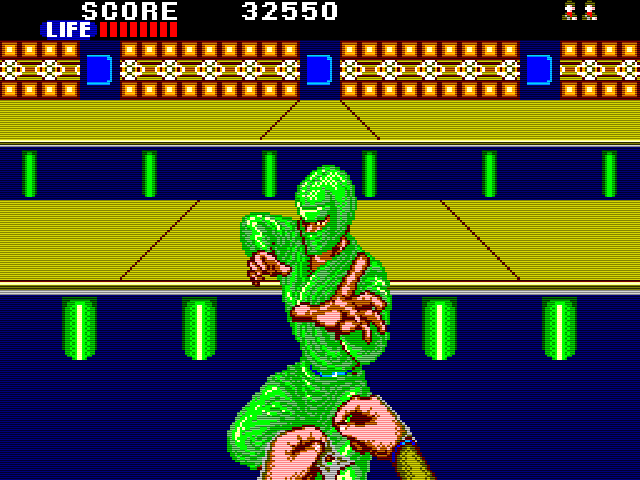 Sega were king of the arcade for most of the coin-op format’s history, and their console efforts often attempted to leverage their arcade success into home success. 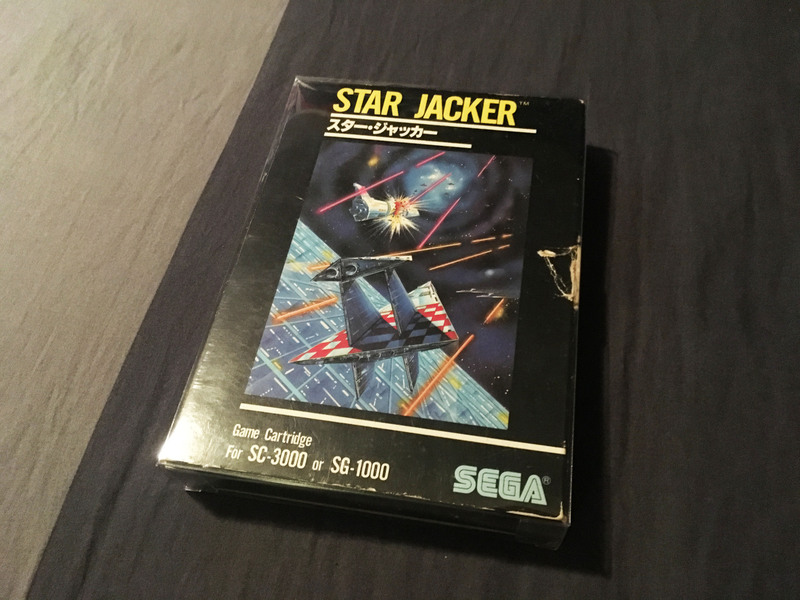 While this would eventually lead them to release one of their arcade boards as a console (the Mega Drive is basically a cut-down Sega-16 board), on their first two consoles it meant ports. 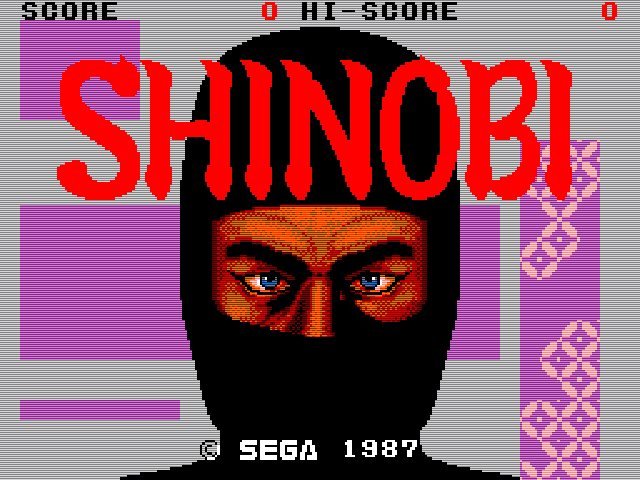 And so we have the Mark III release of Shinobi. 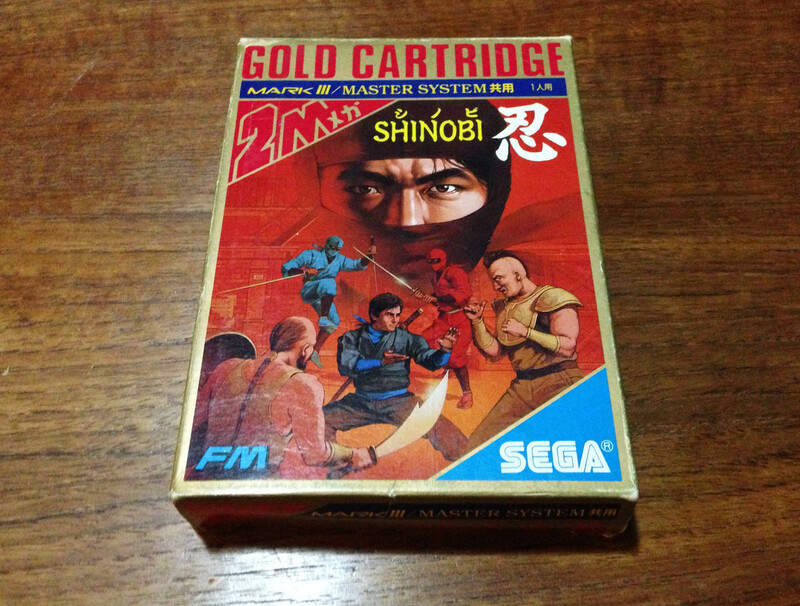 It’s a late enough Mark III release to have the Master System co-branding. 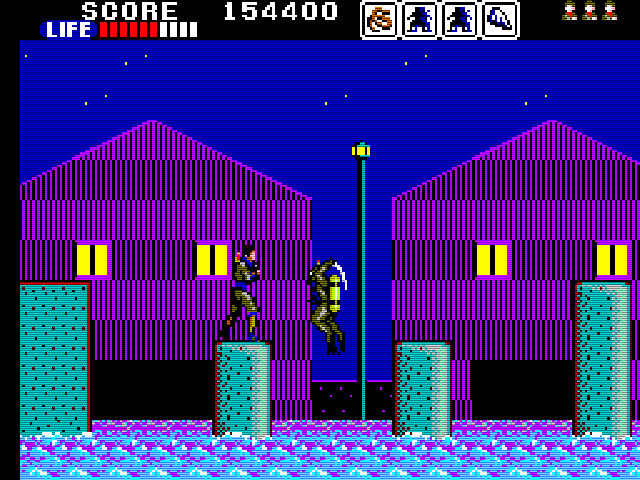 Shinobi is a basic 2D side scrolling action game, which was already a fairly recognisable format by 1987. 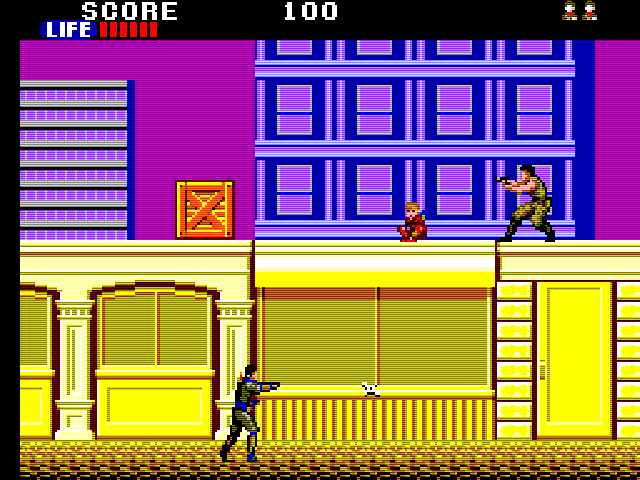 It stars Joe Musashi, on a mission to stop bad guys who are kidnapping children from his ninja clan. 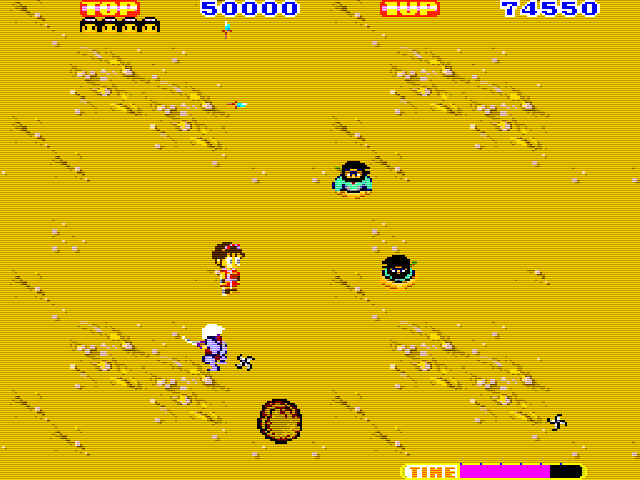 You move along the stage, attacking bad guys with swords and ninja stars while freeing the kidnapped kids. 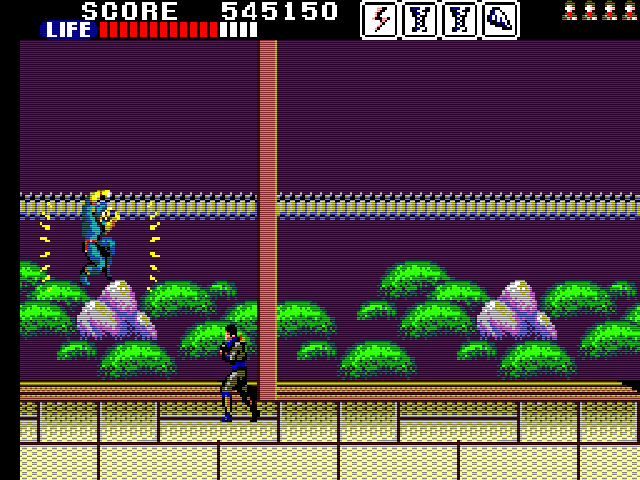 The game’s gimmick is multiple ‘planes’ of action, and at certain points in stages you can switch between planes with a giant ninja jump. 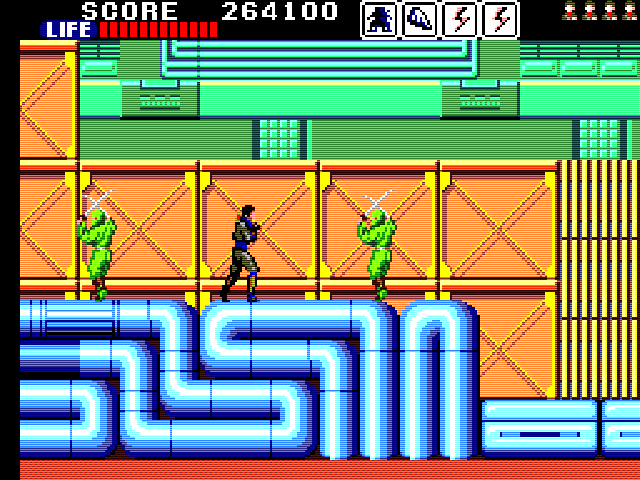 Luckily the bad guys are nice enough to pause and wait for your jump to complete (it’s really supposed to be a sort of ninja movie slow-motion effect I think). 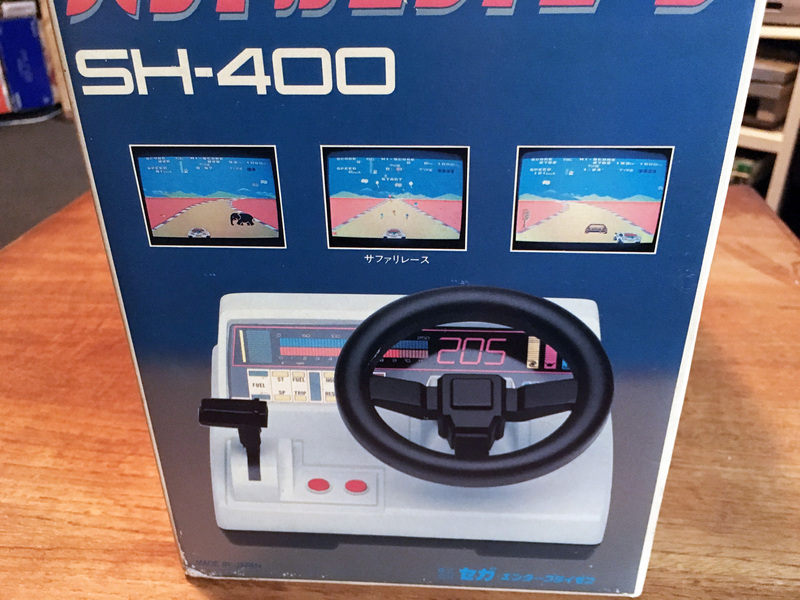 Otherwise controls are decent, solid but standard. 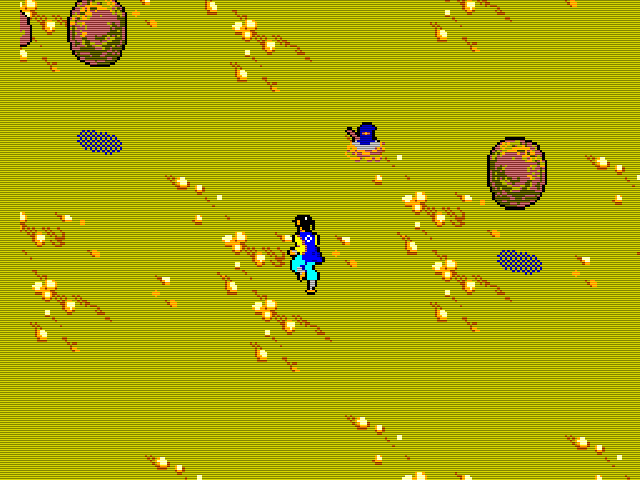 It’s broken into five missions of three or four stages each, with a boss at the end of each mission. 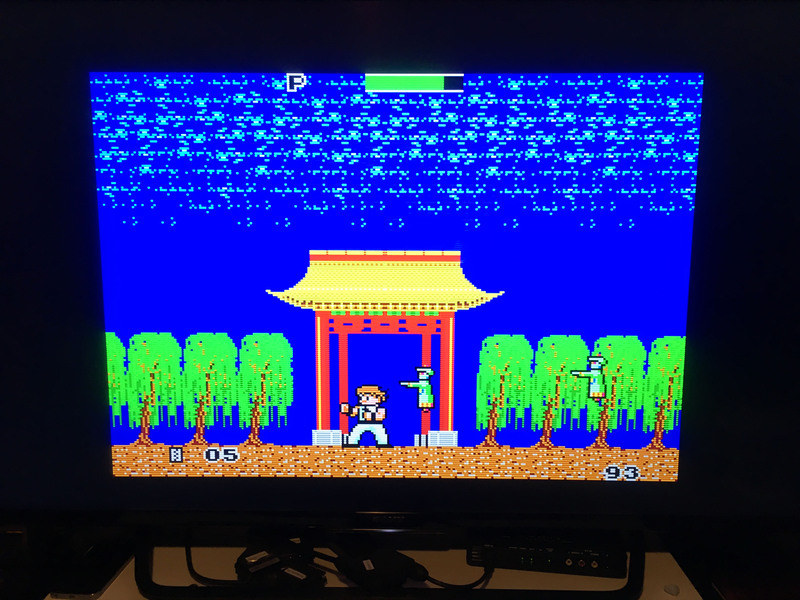 Along the way you can power up your life bar and weapons, swapping out ninja stars for bombs and a knife, and your sword for nunchucks and eventually what appears to be a Castlevania-style chain whip. 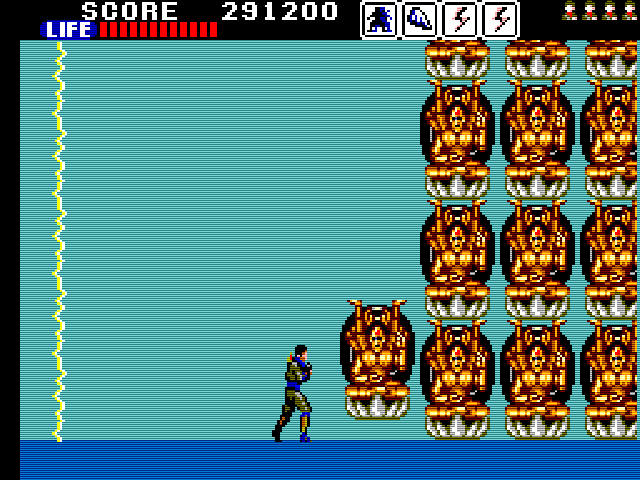 Some later stages can get quite frustrating, introducing bottomless pits and annoying enemy placements. 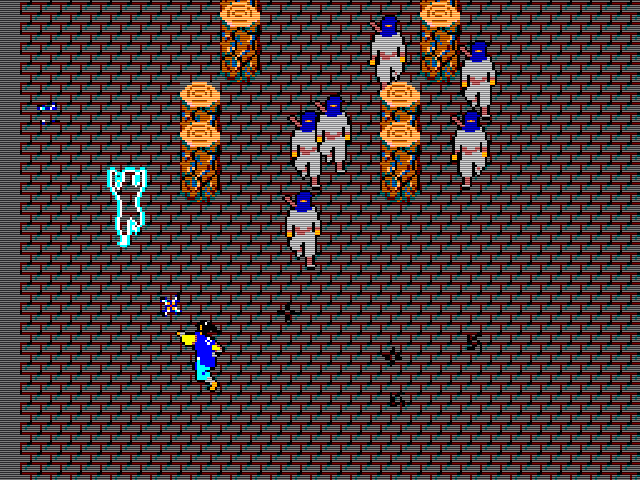 Enemies get weirder and more supernatural as you progress, including some zombie-ninjas and demons. 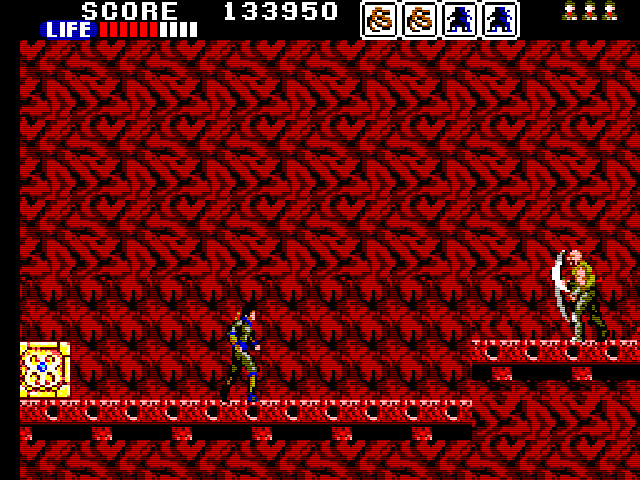 Bosses are quite good, and largely rely on you working out attack patterns and counter-attacking. With one exception – a giant wall of hindu (Vishnu?) statues. After a million attempts I finally worked out the only solution was to spam it with knives, which worked. Frustrating. 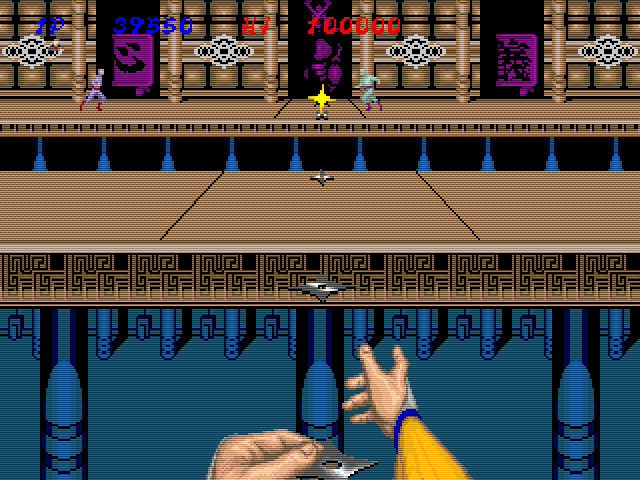 There’s also a very difficult bonus stage once a mission, where you throw ninja stars at two planes of ninjas, shooting gallery style. Graphically it’s decent, but nothing special. Pretty middle of the road for the Mark III. 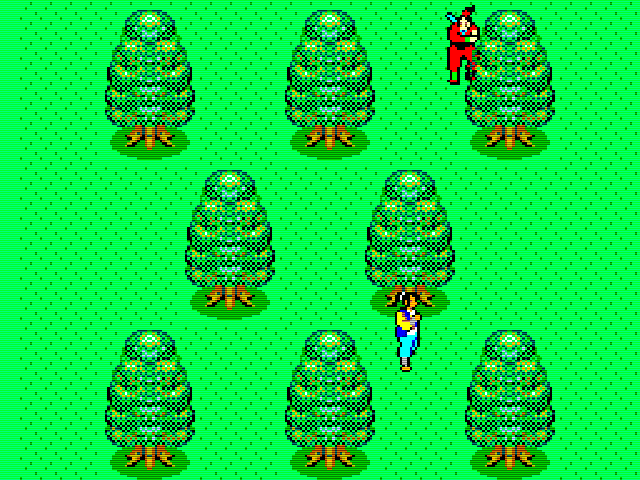 Some incredibly strange palette choices make some parts, especially the first stage, look quite garish, but other stages are fine. What is up with these colours? 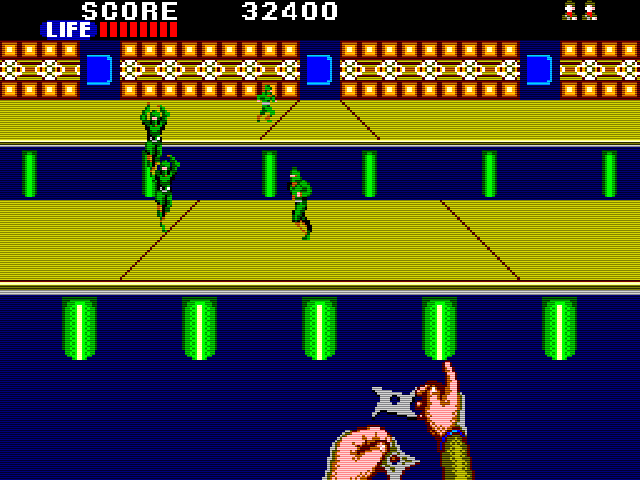 The Mark III version is a reasonable interpretation of the arcade game. 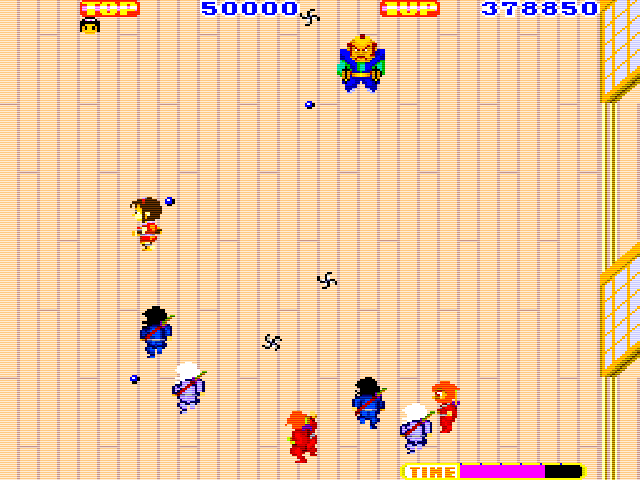 The arcade game is a much faster, more fluid experience, whearas the home version is a slower and more methodical. 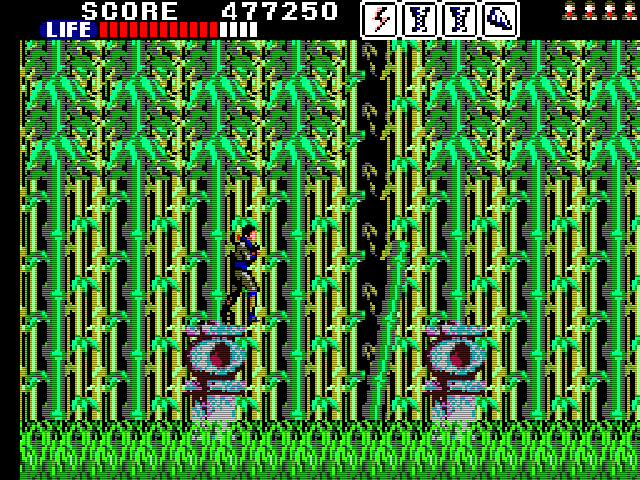 There are less enemies, but despite the very different feel, the levels have been recreated quite faithfully. 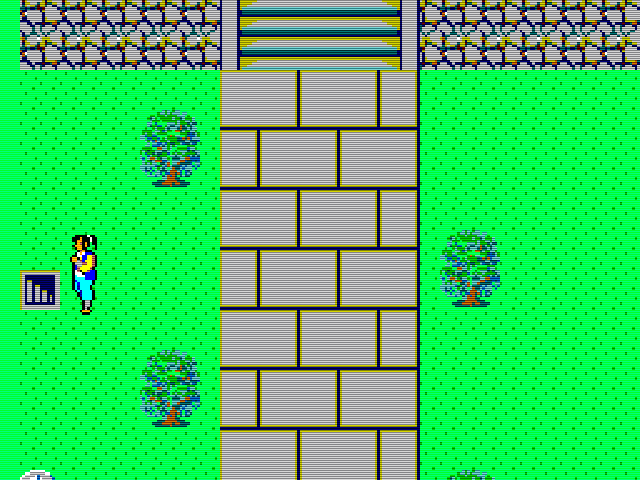 The graphics have also taken a hit from the 16-bit arcade game, but the bright Mark III colours arguably make it more appealing in parts than the drab original. 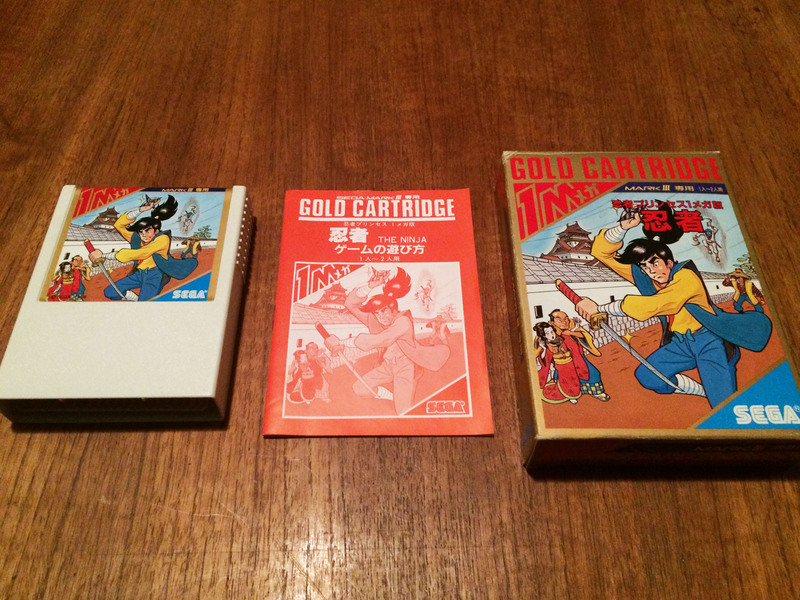 One disappointing element is a common one for Mark III games – small cartridge size. 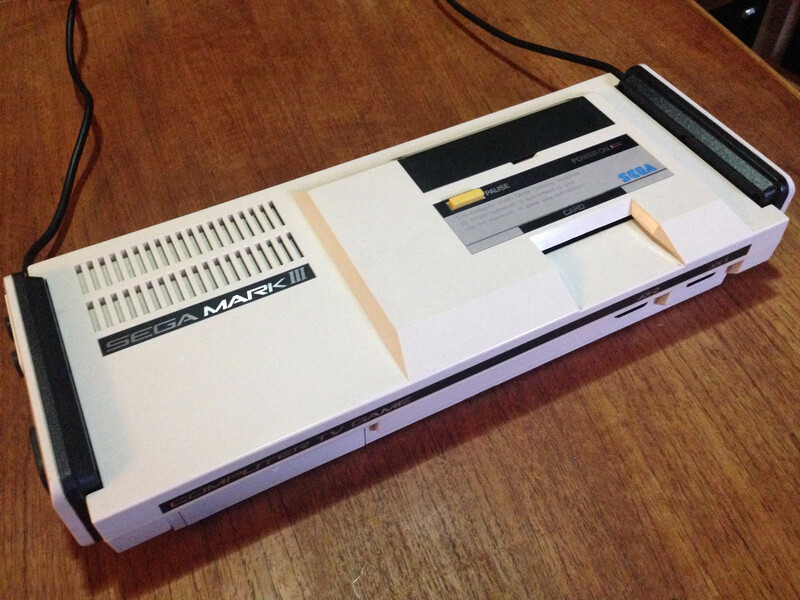 The Mark III had some design flaws that meant it got less graphical tiles from the same amount of ROM than most consoles, and on top of that Sega often chose cheap small cart sizes. 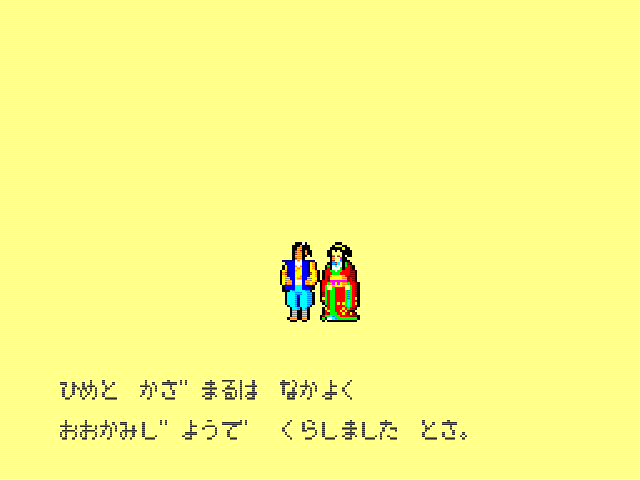 What this means is only a couple of tunes for the whole game (much like Makai Retsuden). 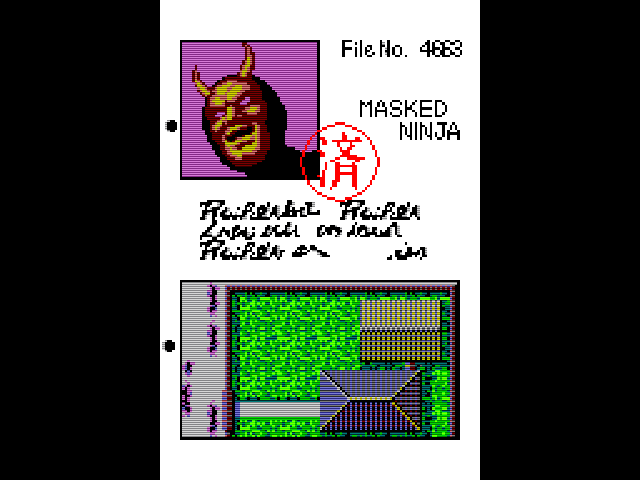 And what happens when you beat the final boss, the Masked Ninja? The tunes at least have FM instrument support, and sound pretty cool if you have an FM Unit. 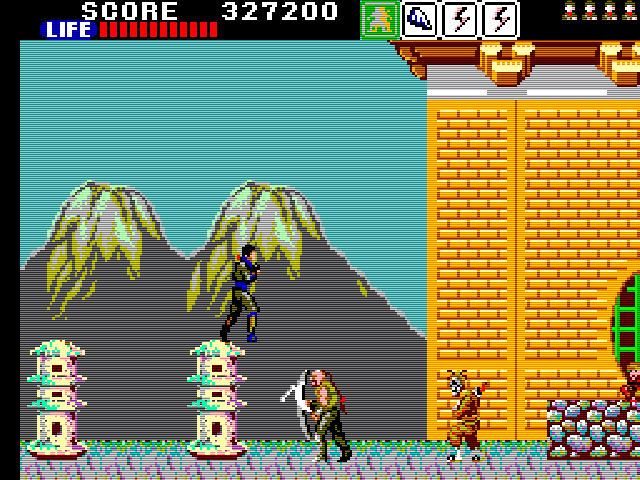 Overall it’s a pretty nice early ninja game, and pretty fun, even if incredibly difficult at points.